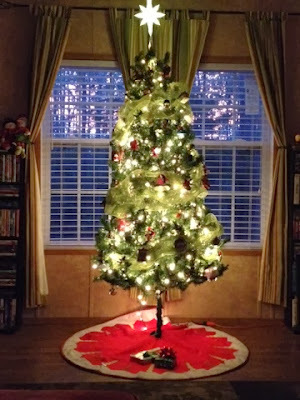 Well – December has come and gone – and it came and went like whiplash; I swear, I feel like this month sped by on wings. I’m pretty sure it has something to do with the fact that Thanksgiving fell so late this year, but December has almost felt like nothing more than a little blip on the radar. It’s crazy! 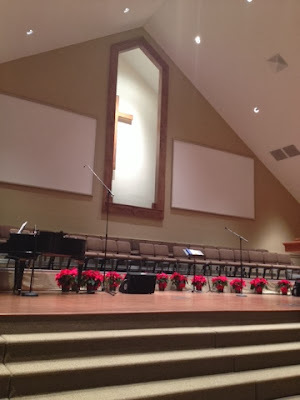 That being said – you know that if December is on the way out, that means the year 2013 is on the way out too! 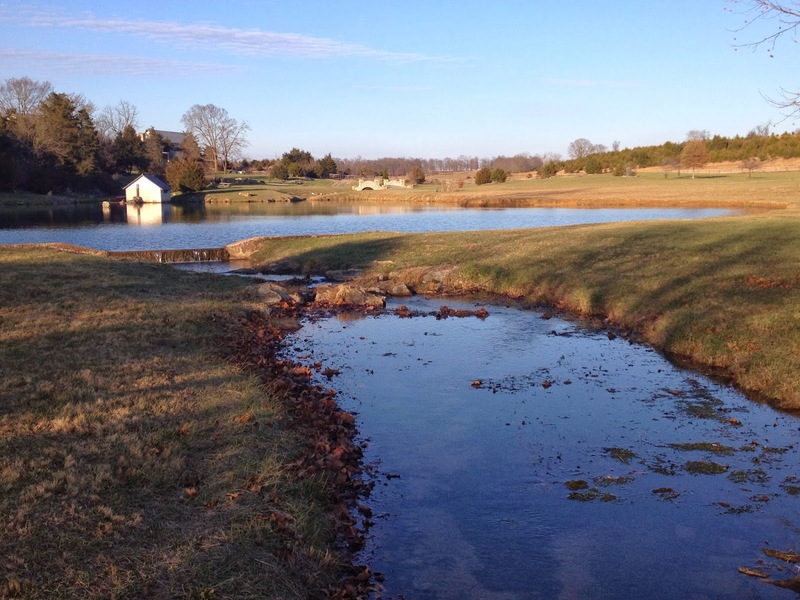 A whole new year – don’t even get me started! Let’s look back at December! And Then Came You by Jennifer Weiner: This book was really good; I haven’t ever read a book by Jennifer Weiner that I didn’t like. This story is about four women and the way their lives intersect; Bettina is wary that her new stepmother India isn’t who she pretends to be, India is struggling to have a child with her new husband and hires Annie to serve as her surrogate and will carry the child conceived with an egg that was purchased from Jules. These women should never interact but circumstances conspire to change their lives – for the better. I love that each character has an honest, heart-felt motivation for the part they play in the story and I especially loved the way the story wound itself up! Like I said – I’ve never been disappointed by a Jennifer Weiner book and this one was no exception! Divergent by Veronica Roth: I finally jumped on this book bandwagon after I was given the first book as a (very) late birthday present. I’d started reading another book and just wasn’t feeling it so I did something I don’t normally do and jumped into this one. I’m fairly intrigued by the premise: a society where at age 16 you are divided into one of five factions based on dominant personality traits. 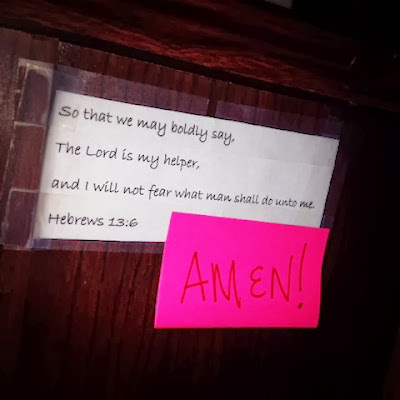 The division into factions is believed to keep societal chaos at bay…which is all well and good until you realize that everyone doesn’t fit into just one category; what does one do when they are…divergent? Interestingly enough, my copy of the book has a quiz that will tell you what faction you are meant to be in – and I’m both Erudite and Abnegation; so I suppose I’m divergent as well. 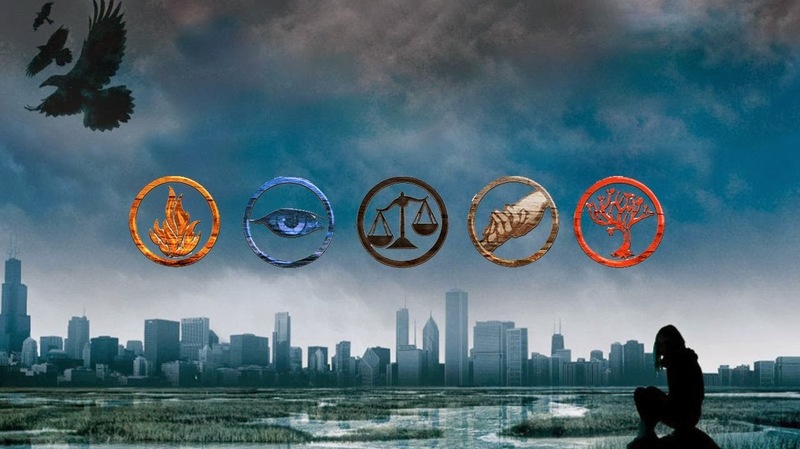 And if you haven’t read the books, then I suppose you’ll have no clue what Erudite and Abnegation mean – and to that I’ll say, go buy yourself a copy of the book and find out! Which Faction would you be in? Insurgent and Allegiant by Veronica Roth: You see, I was given a Books A Million gift card for Christmas from a friend and I’m just 100% positive that I’ll be using that gift card to buy the two other books in the Divergent trilogy. I can already tell you that even though I’m only halfway through the first book – I’m hooked. And I have to say; I’ve read so much about how the series ends and people have been very divided on how they felt about the ending – so I’ve got to read the series and see what happens! I must! Grace for the Good Girl by Emily P. Freeman: I have no clue what this book will entail but my friend Nickolee has been stressing that I read this for months and months now and I guess my Mom saw all the posts about it because lo and behold; it was wrapped up for me under the tree! I’m expecting grand revelations from this book since my friend has hyped it up so much – so I suppose I’ll read this one near the start of the new year; perhaps it will enlighten me in 2014? I know I need to finish my trilogy first – ha! The Sound of Music Live: Yes, I watched this and I 100% loved it! I was already intrigued by the premise when they first announced plans for the show back in September but when I saw that Stephen Moyer had been cast as the Captain, I was definitely in! I’ve been watching Stephen on True Blood for six years now and trust me; him as Captain Von Trapp is a complete 180 degrees from the vampire he plays on True Blood. Plus – who knew the man could sing?? 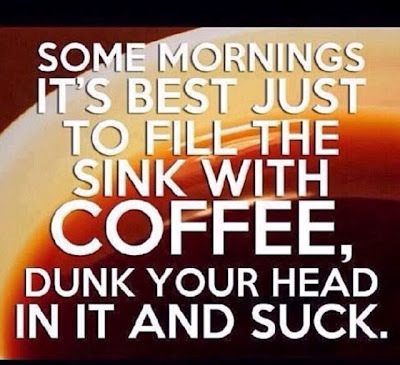 And sing really well! I snuggled on my couch and watched all three glorious hours and I even sang along with the songs. I still can’t believe all the backlash that the production got – from criticism that they were trying to remake the movie (nope – this was the stage version; different thing) to bashing Carrie Underwood’s acting skills (which weren’t amazing, but no one ever claimed she was an actress) and people who downright hate the Sound of Music but (for reasons I will never understand) chose to watch it and hate on it. I loved it so much I bought a copy for myself – and I even listen to the soundtrack from time to time. Stephen Moyer does a mean Edelweiss! Maria and the Captain – for the 2013 audience. Downton Abbey: Oh yes, I’ve done it! I avoided the show for so long but between my sister and my friend Nickolee (gee Nickolee, you are getting pushy these days, aren’t you? Ha-ha!) constantly insisting that I start watching it, I had to give in. Well – I had to give in because Lindsey brought it with her over Christmas break and we all watched the first two episodes. 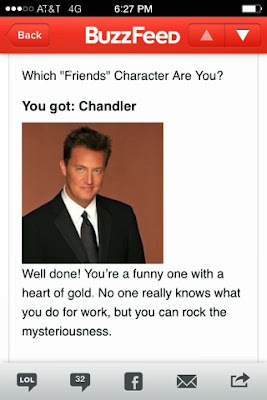 Lucky me – she left the first season with me and I won’t even lie – I binge watched the whole first season in the course of 12 hours. I was off work on December 26th and since I’d already seen the first 2 of the 7 episodes that make up season one, I just went for it and finished it! Of course, I’ve still got to see seasons two and three before I can watch season four (which I will be DVR’ing for a later viewing) but suffice it to say – I’m addicted to all things Downton now. Also – if you don’t know what Downton Abbey is about; I can’t elaborate, I’ll just go ahead and conclude you’ve been living under a rock for the past three years. Homeland: Yes, Lindsey hooked me on another show over Christmas break and I also may or may not have binge-watched the first season of this while I was sick on the Friday and Saturday after Christmas; it was a suspenseful few sick days! Homeland sets the premise that newly returned POW Sgt. 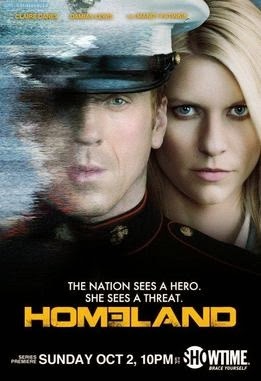 Nicholas Brody has been turned by a terrorist cell and is waiting for instructions to carry out an attack at any moment and CIA analyst Carrie Mathison is the only person who actually believes that Brody has really been turned; the rest of the world sees him as a hero. It’s so thrilling and intriguing and while it took me an episode or two to get into it, by the time I was watching episode three I found myself sitting at the edge of the couch waiting to see what would happen next! And now I’m waiting with baited breath for season two to arrive in a package on Thursday so I can see how it further unfolds! 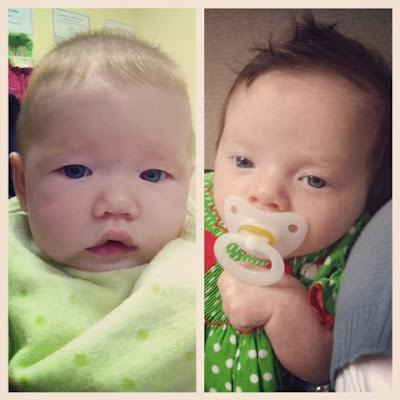 I’m hooked…hooked…and I love them both, even though they’re both crazy. 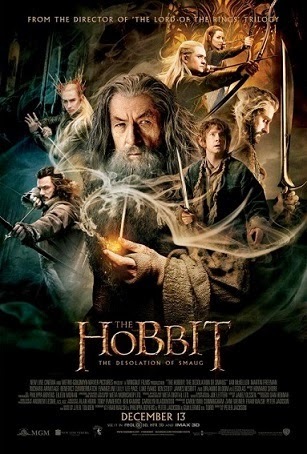 The Hobbit: The Desolation of Smaug: The second movie in the Hobbit trilogy and it was better than the first! The company of dwarfs led by Thorin Oakenshield, along with Bilbo continued on their journey to the Lonely Mountain – this time encountering giant spiders (gross – just gross) woodland elves (hey Legolas!) mean-spirited humans in Lake Town and numerous packs of orcs before finally arriving at the summit of the Lonely Mountain. Once they surmise a way into the mountain, they face their greatest opponent yet – the dragon Smaug. The movie was excellent – full of action as well as amazing scenery since this trilogy was also shot in the beautiful country of New Zealand. I went to to see this on my own on a Sunday afternoon and enjoyed every minute of it – especially the winks and nods to the earlier made Lord of the Rings trilogy! Surprisingly, that is the only movie I watched this month – I mean; there are a ton of movies currently out that I’d love to see but as I mentioned, this month has whizzed by! 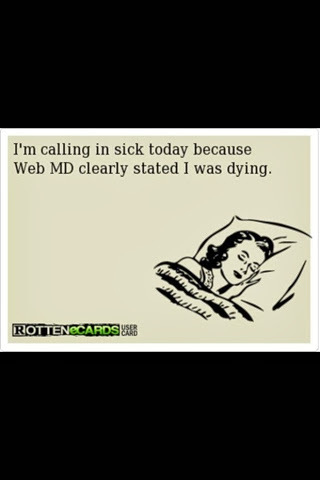 And I just haven’t gotten out to see anything else. Crazy! The Sound of Music Live! soundtrack: What can I say, I’m a sucker for musicals and as I mentioned above, Moyer does a mean Edelweiss. And we all know Carrie Underwood can belt a tune – and don’t even get me started on the woman that plays Mother Abbess. Hello songs! The Pentatonix Christmas CD: Includes some of my favorite Christmas songs; actually has my FAVORITE Christmas song – O Come, O Come Emmanuel and the boys and girls of Pentatonix can sing some acapella like nobodies business! An excellent iTunes find! I See Fire by Ed Sheeran: The theme song for the Desolation of Smaug; this song is really pretty and Ed Sheeran has a great voice. I have listened to it over and over and it has the distinction of being the first song I listened to in my new car – with my phone hooked up, of course! White Trash: My Dad ever so sweetly asked me to make him some for the holidays and though I’d never made it, I found a recipe, grabbed the ingredients and whipped up some! 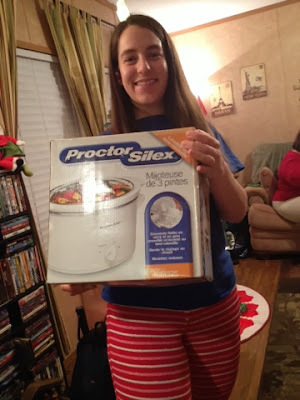 I didn’t realize how easy it was to make or just how delicious it was but I think it will become a staple for my holiday cooking from now on! Watergate Salad: Another thing I have not ever had but absolutely fell in love with once I tried it. This is probably a far cry from being anything remotely close to actual salad…but it is green! This is Cool Whip, pistachio pudding mix, crushed pineapples and walnuts all mixed together to make greatness! My Aunt Beth made it for the Watson Christmas and again on Christmas Eve and I could have taken the bowl and just eaten it all! Holiday Cookies: From – where else? 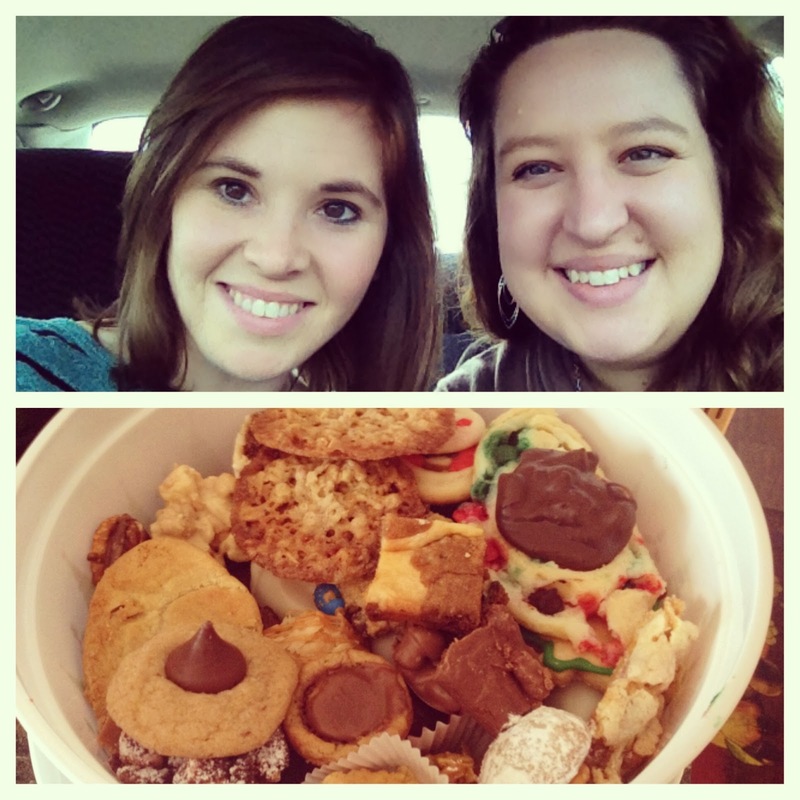 The church cookie swap! 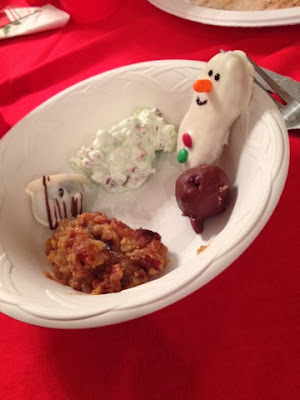 I just enjoyed eating holiday goodies both savory and sweet all month long! Cookie swap goodies and my good friend! Sherlock Season Three premiere! Yes! January 19th on PBS, for three delightful weeks Sherlock and Watson will be back on the case and I cannot wait! How did Sherlock survive that fall? 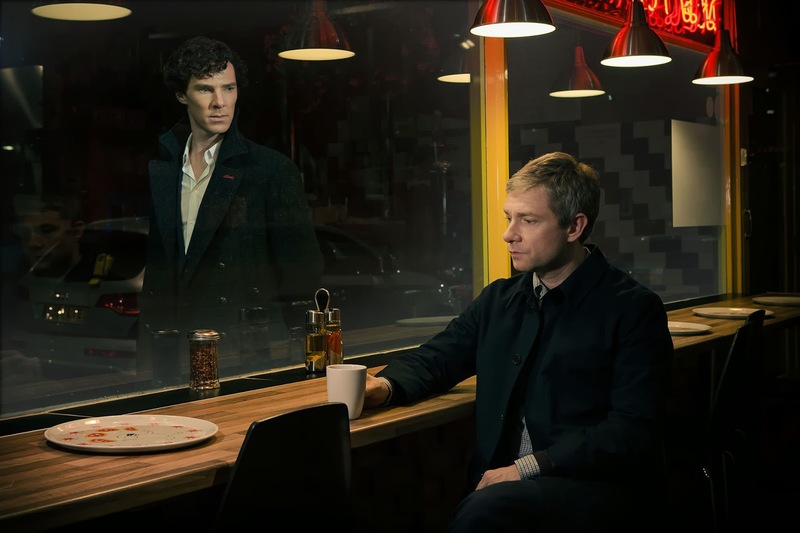 How long will Watson stay mad once he realizes that Sherlock faked him out? I can’t wait to find out how it all plays out – even if it will be over in only three short weeks! Just 19 days now…how did he survive the fall? And I suppose that’s all – January always seems to be somewhat long and dull. I can’t remember any Januaries from the past being remarkably thrilling. I think I’ll just settle in for some Sherlock, reading some good books and hoping that maybe January will surprise me in some way. 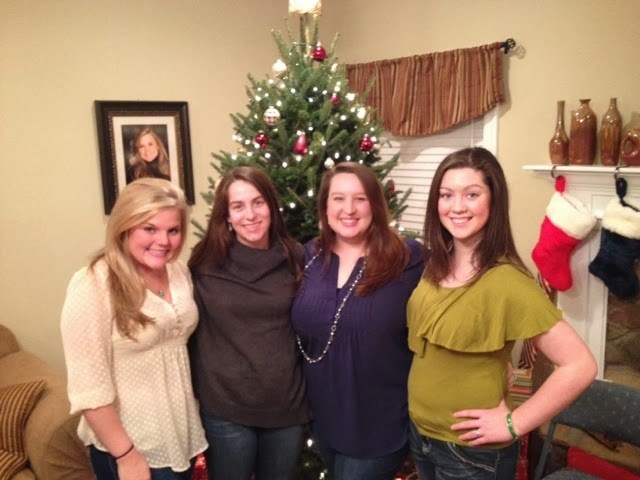 My Christmas Festivities…nothing but pictures. Enjoy! Driving my early Christmas present to the Watson Christmas on Saturday night! And so many desserts too…yeesh. But delicious! 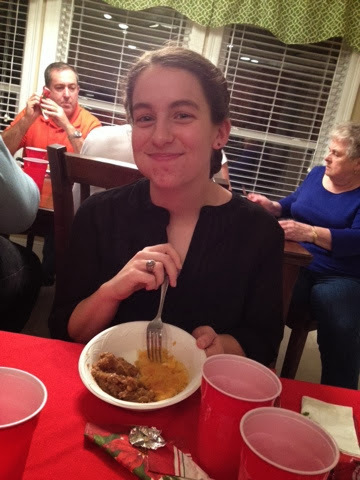 Someone has a mouth full of goodness…sweet potato or corn casserole? 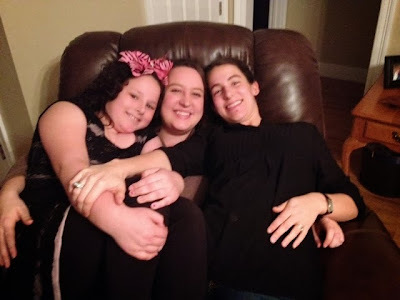 Holding some “babies” in my lap – the little sis and the littlest cousin! 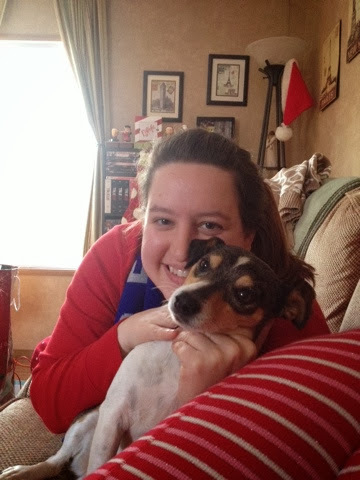 Smiling with little Miss Riley! 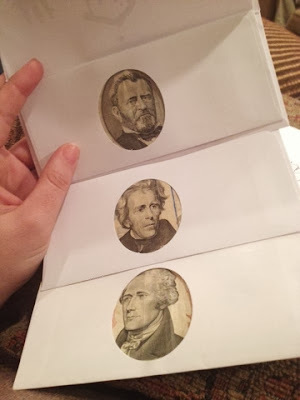 I got lots of Presidential portraits for Christmas from my Watson family members – nice! I’ve already put some to good use. 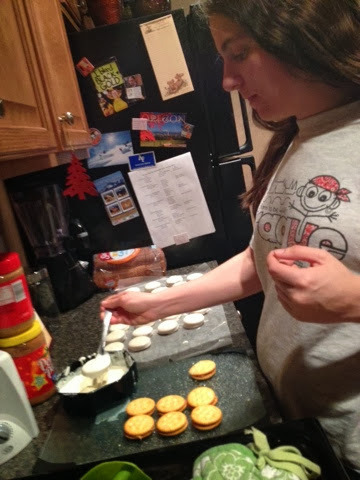 Teaching little cheffie how to whip up some Peanut Butter Almond Bark cookies! 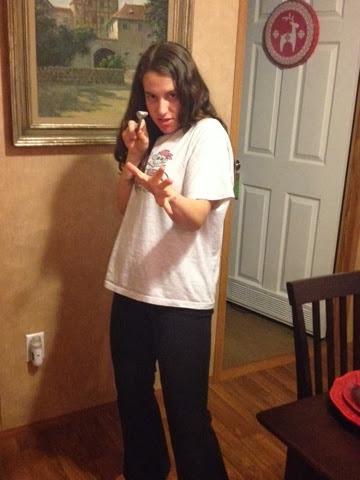 I trained her well – she’s already a pro! 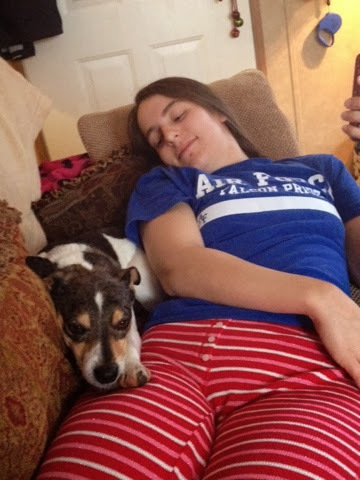 These two – they are like two peas in a pod; he makes every step she does & when she sits, he’s in her lap. 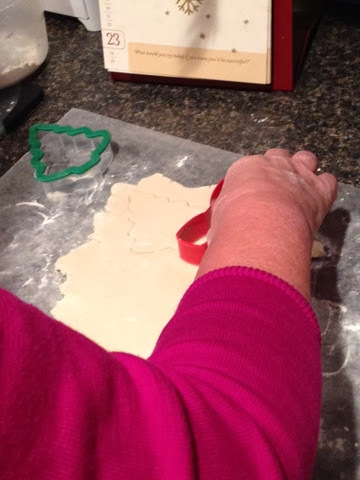 The annual making of the Christmas cookies – Mom cuts them with expert precision! 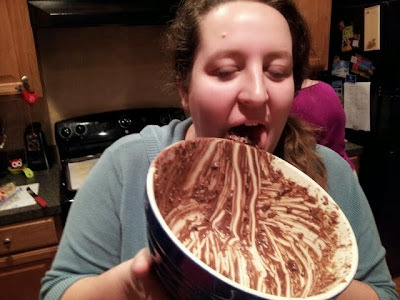 Nothing wrong with licking the bowl, right? 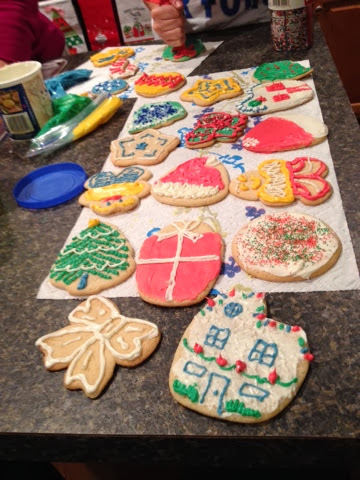 The finished products – so colorful and cheery. Tasty too! 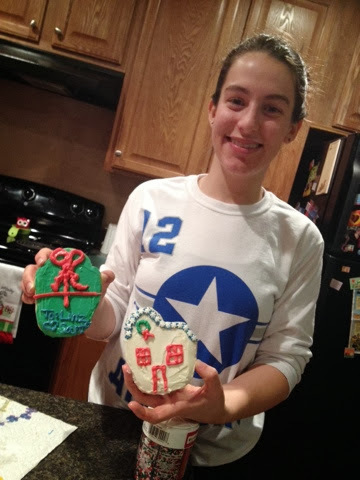 Lindsey with two of her favorites – a present and a decorated house. 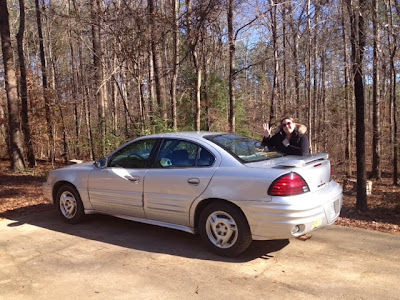 Saying good-bye to my first car on Christmas Eve – it has been given to new owners who love it and will care for it. 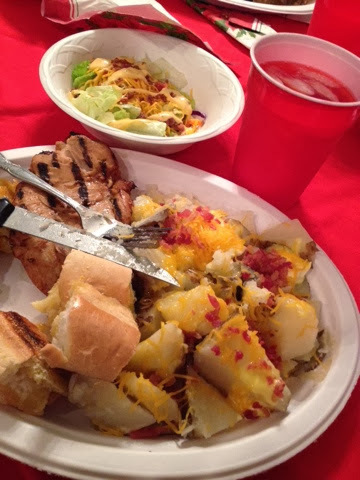 Christmas Eve party at the McKeithens – the food is always amazing! 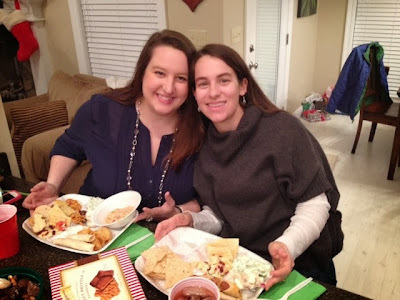 Sister shot before we scarf down our yummy plates! 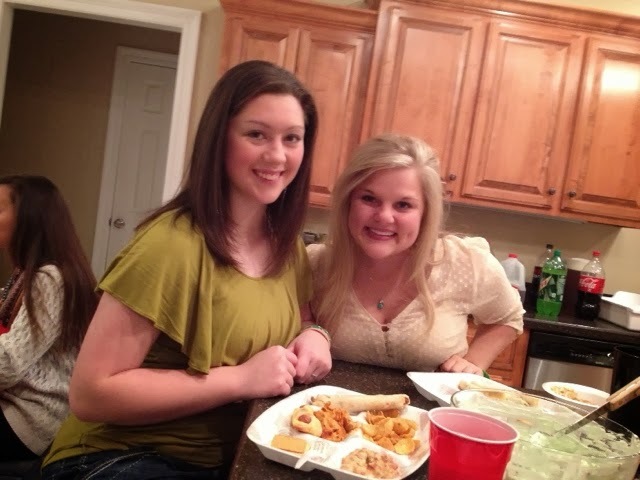 McKenna & Jodi..ready to eat some yummy food! 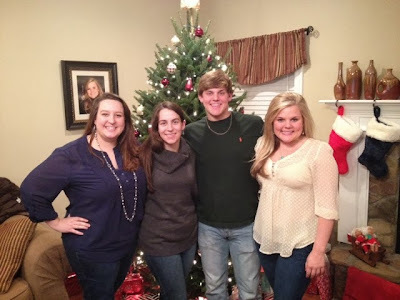 The Watson cousins – minus one. 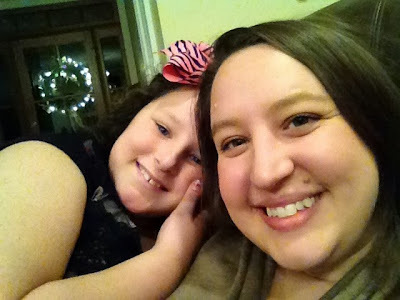 We miss you Alisha…. The three “sisters”…we are growing up too fast! 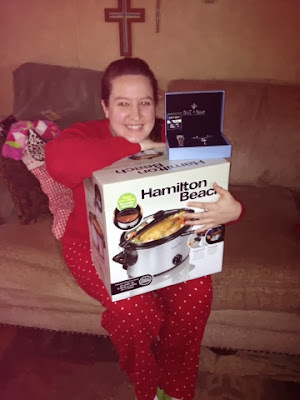 My Santa gifts…a new crock pot and a lovely jewelry set. 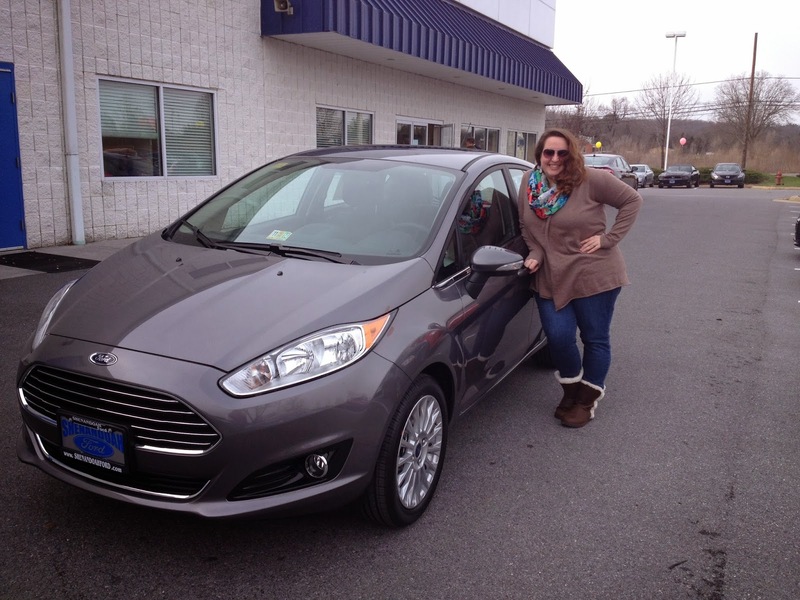 Oh yeah…and there’s a car outside too! Lindsey’s awesome t-shirt blanket from Santa! 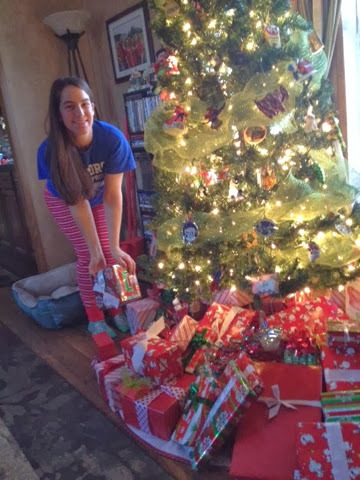 Ready to play Santa Claus and pass out all those presents! 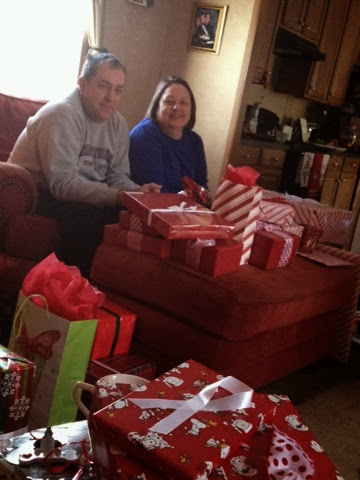 The parents smiling with all their gifts – they must have been good this year. 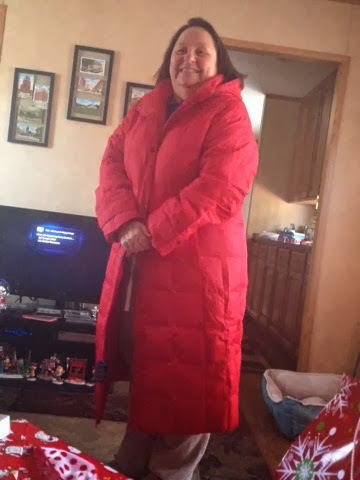 I think Mom really loves her new winter coat! 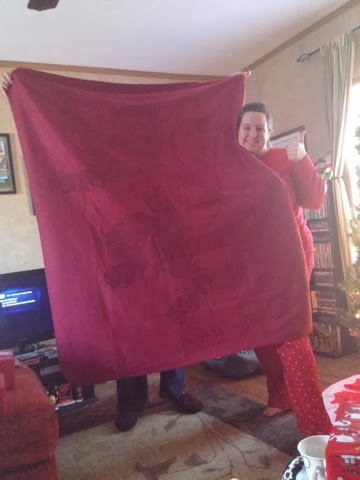 A Lannister blanket – Lindsey knows me too well! All of my presents were wrapped in Snoopy paper – I loved it! Another awesome present? 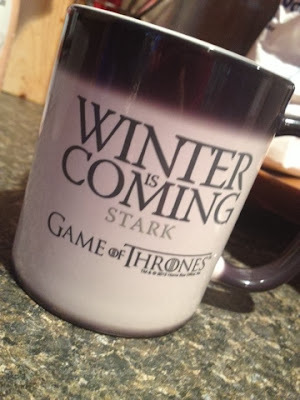 A color-changing mug; this time it’s Stark instead of Lannister. 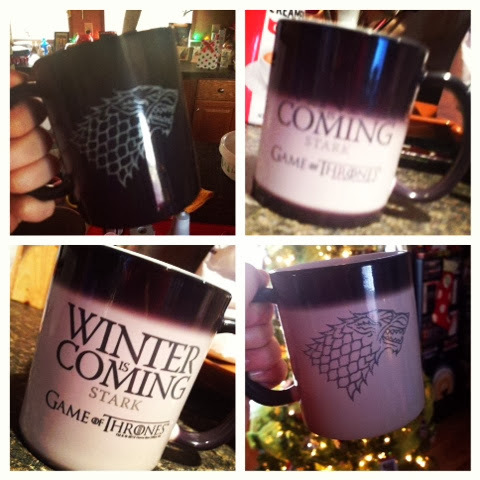 The mug in action – I love it! I think he was pretty pleased with the Saints sweatshirt that I gave him – look at that grin! 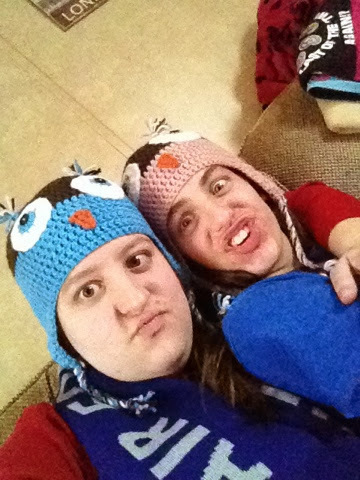 We got owl hats – awesome! A tea kettle – she loves it! Surrounded by all our things…so much stuff…whoosh. 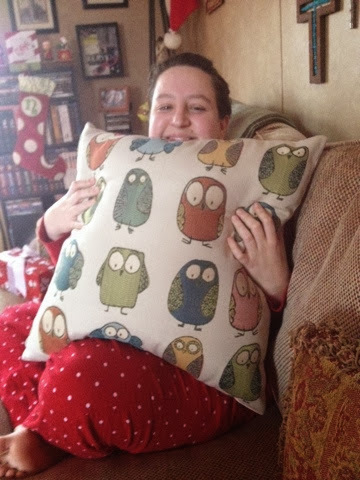 Slowly getting weary from all the present opening…. And asleep…oh geez; they are too much. 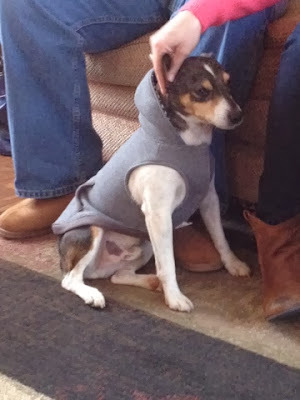 Wearing his new hoodie – he looks so sharp! 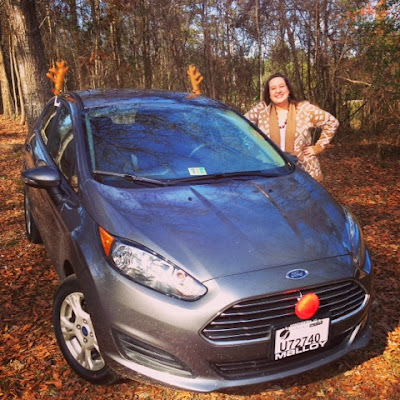 The new car all decked out for a Christmas drive! 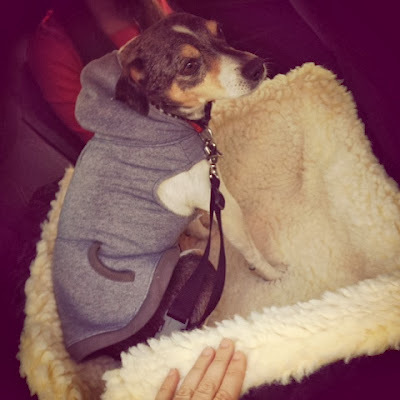 Testing his new car seat…he’s fan. 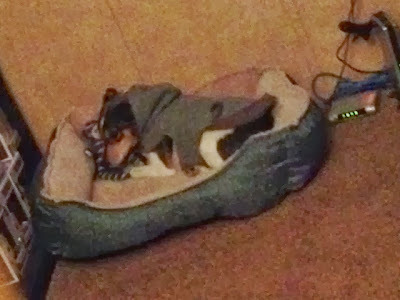 And also loving the bed and sock monkey that Santa brought him – sweet puppy. Passing my first crock pot on to Lindsey…she’ll have her own home soon & needs to be able to cook good stuff. 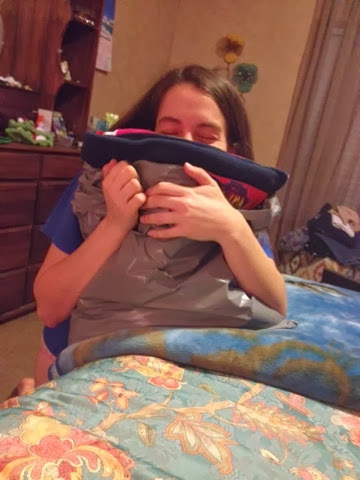 Smelling her t-shirt blankie as she packs…so silly. 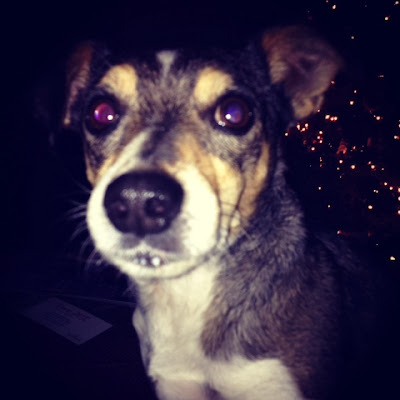 Sunday night beggar face – acting like he didn’t just bury his nose in my cup of milk…even though the evidence is as plan as the nose on his face (and directly under the nose on his face). 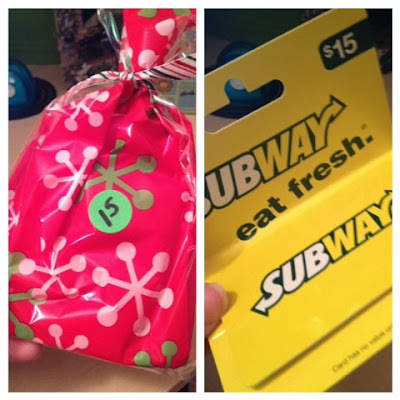 Day 15 – A Subway card! 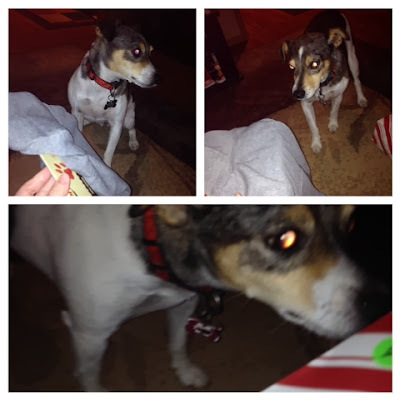 Day 16 – A new collar for Watson; can you see how thrilled he was? 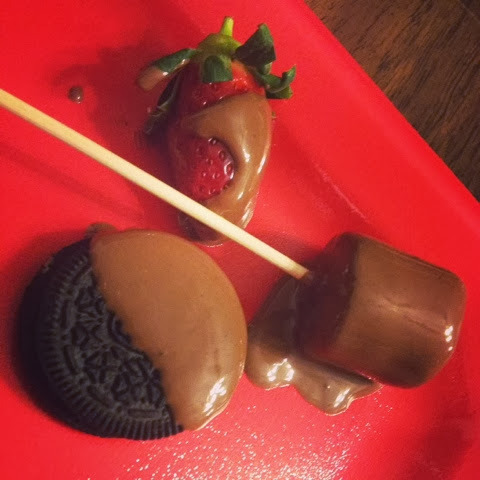 There was a chocolate fountain at the Church Staff Christmas party. Delicious. 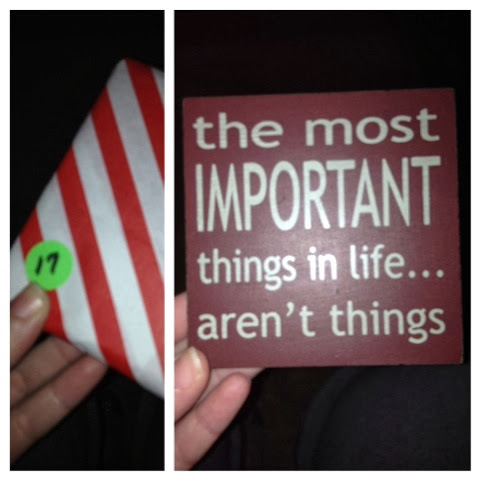 Day 17 – A small plaque, which is now hanging in my kitchen! 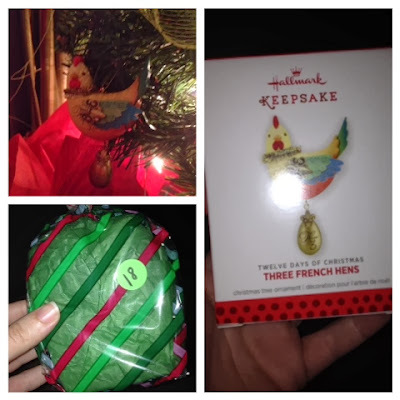 Day 18 – Three French Hens; the third ornament in a series I am collecting, the 12 Days of Christmas! 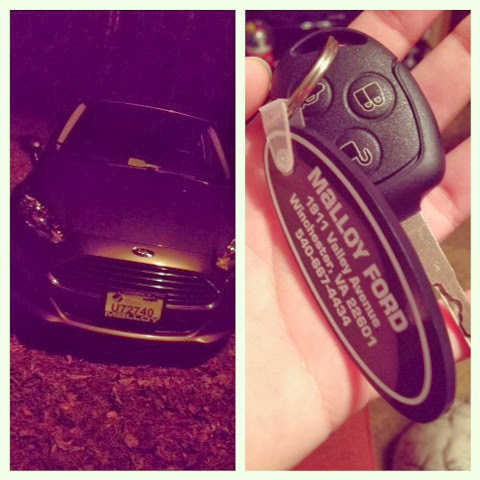 I got some very exciting pictures on Wednesday (which would have been the 18th) – they were pictures of my lovely new car that had been picked up at the dealership and was now with my parents! It was almost to me! Yahoo! Once my little sister got to Virginia on Wednesday night, she told me “I saw your car, I saw the Party Wagon. It is sitting outside the house…I even reached out and touched it!” Oh, the excitement! Pictures of my car on Wednesday after it got picked up! YAHOO! 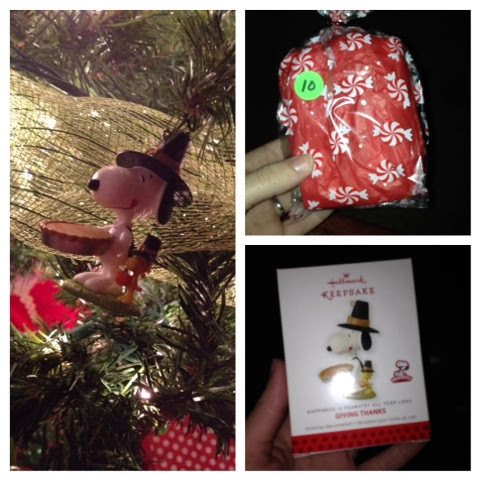 Day 19 – Treats for Watson! 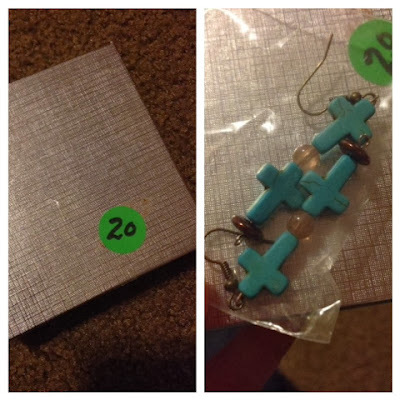 Day 20 – Earrings for me, so cute! 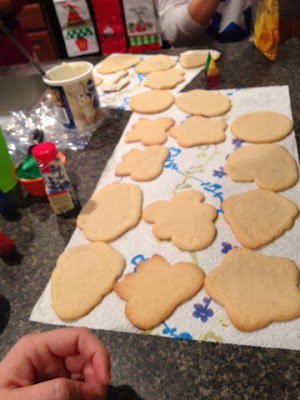 Friday evening became a flurry of activity for me; I thought my family wouldn’t arrive until around lunch on Saturday but they were able to leave earlier than planned and so they were due to at my house by Friday night! I had to rush around cleaning and throwing things together; things I thought I’d calmly do Friday night and Saturday morning. It was a good kind of rush though; knowing my family would be arriving sooner than planned always causes a good kind of rush! I also ended up opening my last two presents on Friday night; which meant that Watson and I both got a present in the same day, ha-ha! 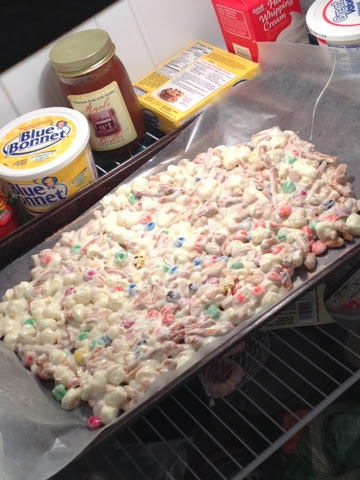 In the midst of cleaning on Friday night, I managed to throw together some white trash for my Dad. 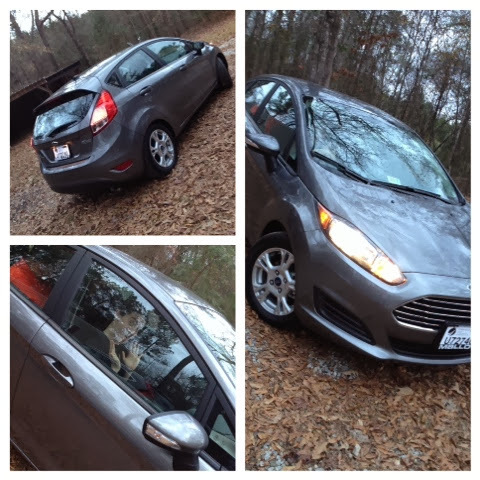 MY CAR! 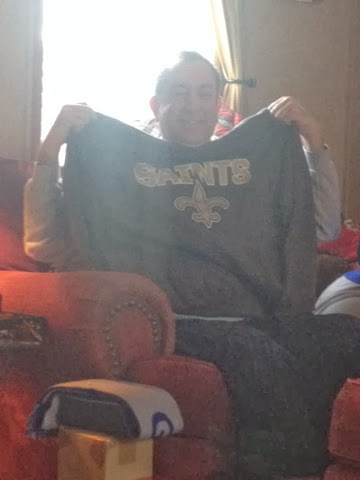 It arrived (with my parents of course) around 11:30 on Friday night! 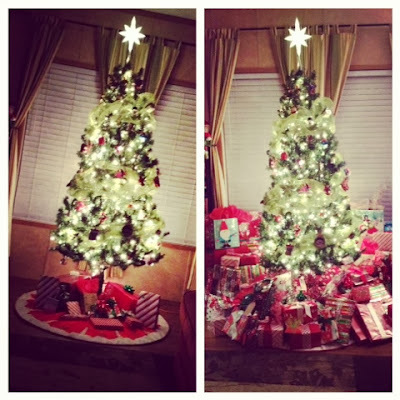 My Christmas tree before my parents arrived…and after they arrived. Yikes! Well – that’s all for now. Short and sweet. I’ll keep updating this week…playing catch-up! Gosh, there are only two and a half days left in 2013 – where has the time gone?? Well…we are a week closer to Christmas; only nine days if you want to be exact and it seems like this month is flying by, and by correlation, the year is speeding by as well. As Charlie Brown would say, good grief! I don’t know about you, but I feel like every year passes even faster than the one that proceeded it and this week seemed to speed by as well. 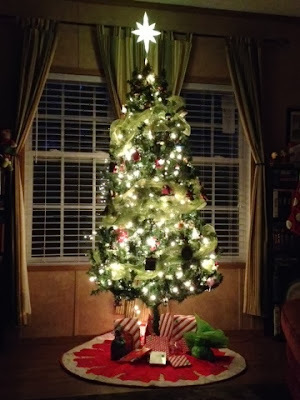 I’m not one to wish my life away but I do have to say – I won’t mind this next week clipping along because on Saturday the 21st my family (and my new car) will be here for Christmas and I can’t wait! 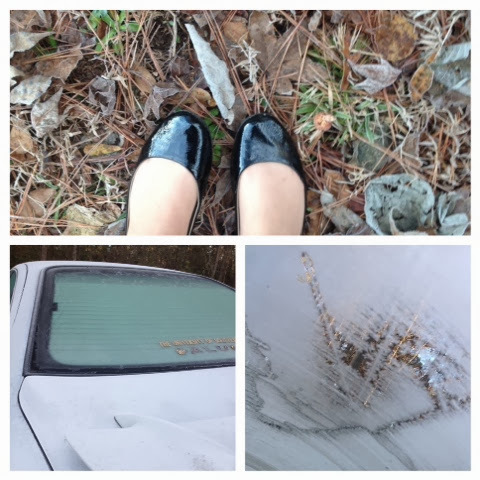 A look back at the past week…. This nut couldn’t wait to go outside to play on Monday morning – especially since it had finally quit raining! 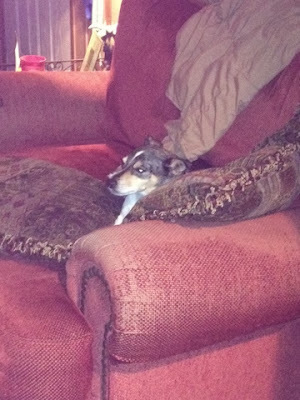 This little dog of mine; I just don’t know about him sometimes. I’ve recently discovered he has a very strong streak of impatience.He has started to beg, whine and even cry to go outside – and let me assure you that if I don’t let him out in time, he just stalks back to his bed and sulks. Last Monday was no exception, the rain had finally passed and he wanted outside immediately. 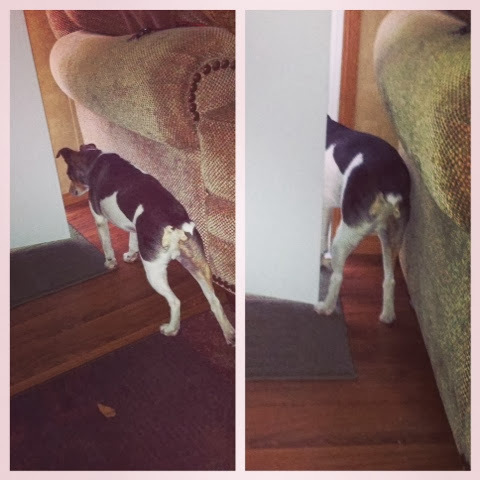 He scooted himself into the crack between the couch and the door and sat there for almost fifteen minutes until it was finally time to go out – and then he realized that the only way to back out of the “hole” he’d gotten himself into was to back up…I was tempted to beep for him as he backed up…ha-ha! The whining and crying has been repeated the past few mornings and it’s absolutely pitiful. He’s a mess, no doubt. 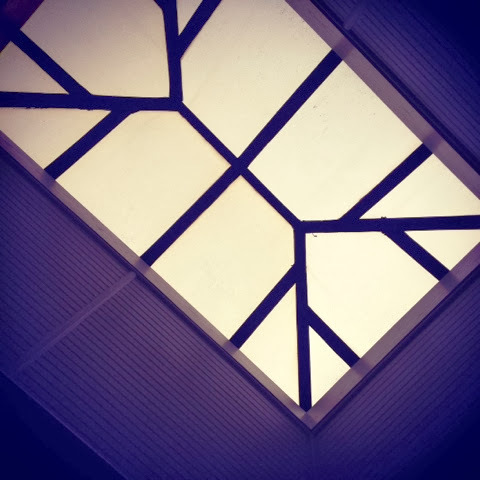 A skylight at the office where a co-worker & I worked on Monday. I loved it. Day 8 – looks like I’ll be eating pizza! pizza! 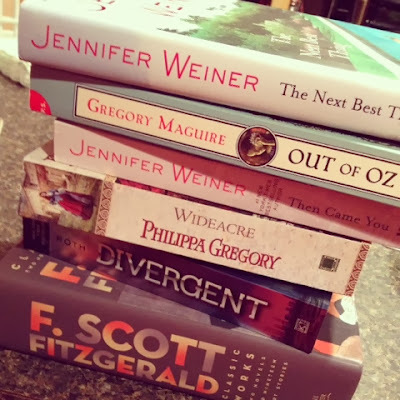 I have quite a few books to read in the coming months…. Day 9 was a hoodie for Watson. He wasn’t really too sure about it. 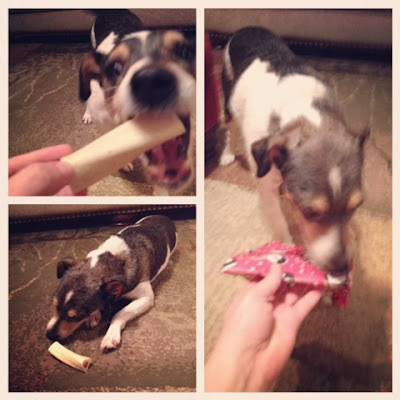 While I’m discussing my dog being a mess, I should mention that since he’s gotten a present or two in the gifts this month – he now thinks that every present is for him. 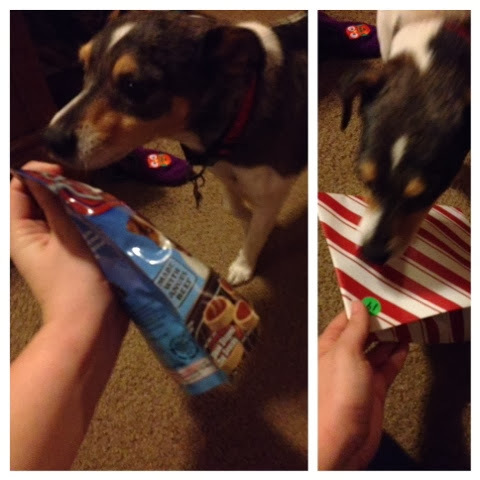 He comes running when he hears paper rustling and even if the gift isn’t for him, he has to sniff it down and in some cases even give it a small lick of approval. I’m telling y’all – this little dog is too funny! It was just a wee bit chilly on Wednesday morning…I may have had to sit in my car for a few minutes before I could drive off…. The presents under the tree are multiplying! 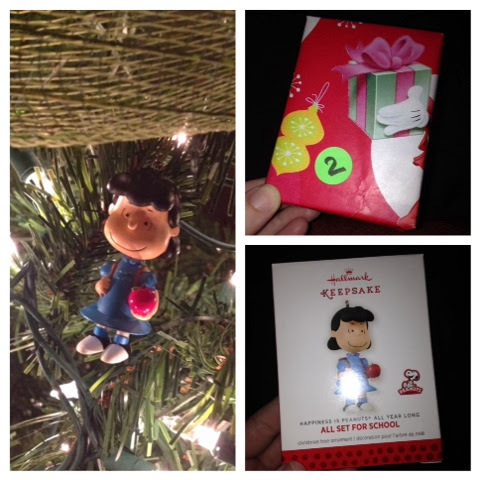 Day 10 – the third ornament in the series; the month of November! This result is not shocking at all…. Cookie dough waiting to be baked up good in the oven! I swear my car knows it’s days are numbered…. I have to say – I think my car is sentient. As in, the vehicle knows it’s days are numbered and it is going to try and mutiny on me. The blinkers are already on the fritz, only working half the time and the AC has long ago decided to blow anything that remotely resembles cool air. 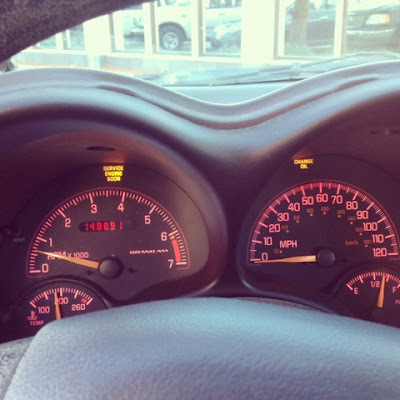 My car is almost thirteen years old and has been a great car; a car that I’ve absolutely loved…but the time has come to move on. And I’m pretty sure my car has realized that and it’s angry with me. The evidence of this is that out of nowhere, the service engine soon light came on Thursday…you see, my car is telling me “I know what you’re trying to do and I’m not going to take this departure easily!” Oh well – you’ve only got four more days little silver car…and then the jig is up! 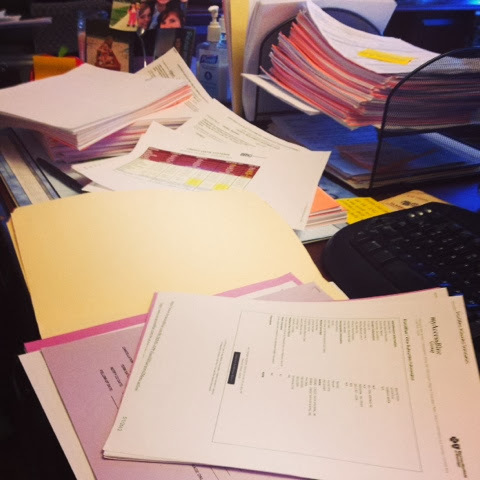 My desk being this cluttered makes me feel like I’m going to have a panic attack….seriously. 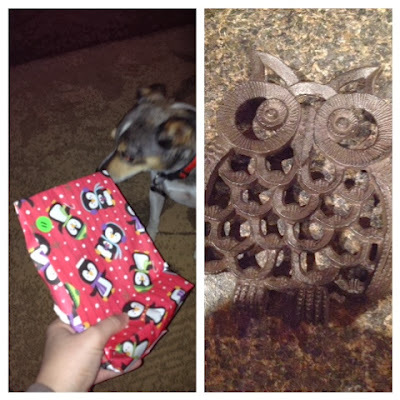 Day 11 – the most awesome owl trivet! And Watson’s look of disgust when he realizes it’s probably NOT for him. 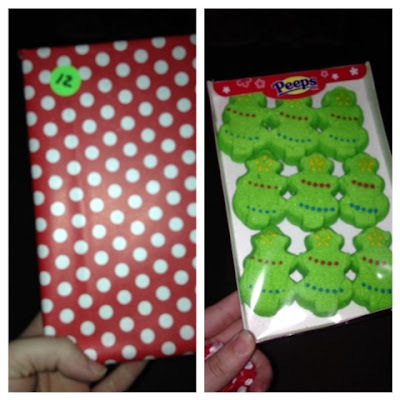 Day 12 – Christmas tree Peeps! Saturday morning was the churches’ annual Ladies Cookie Swap and I look forward to it every year. 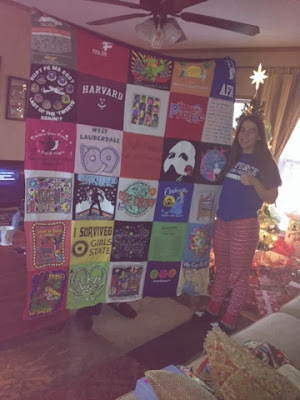 I invited a wonderful friend from college to go with me this year (for the second time) and I was so excited when she was able to make it! We ate some delicious brunch, visited with ladies from the church and each took home a tub full of delicious Christmas goodies. 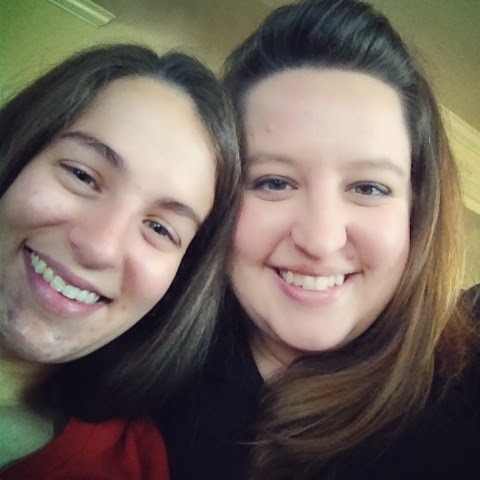 Lisa and I also ran around town for a little while on Saturday afternoon – it was so nice to get to spend some time with her; it’s always wonderful to spend time with friends, right? I spent the rest of my Saturday afternoon and night wrapping presents, watching a Christmas movie (The Family Stone) and attending the office Christmas party. I really felt like my Saturday: while wonderful and packed with good food, a great friend and plenty to do, it just flew by! 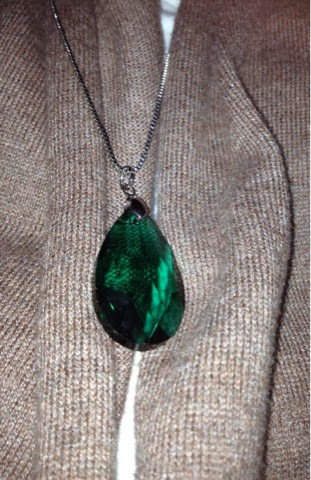 Granted…I think all days kind of fly by these days! 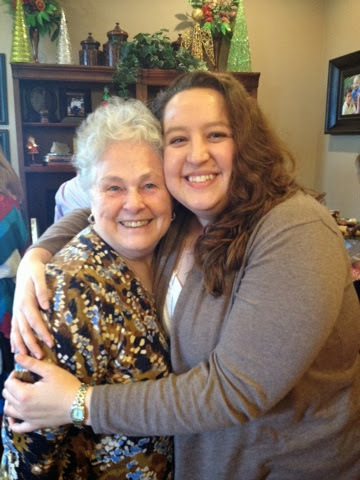 At the church’s Ladies Cookie Swap on Saturday morning – with my sweet Nanny! 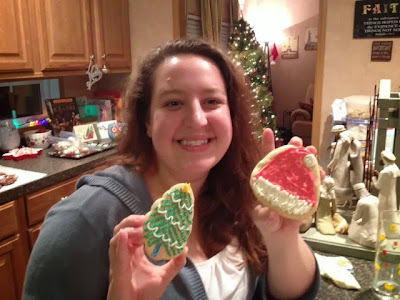 All my cookies…and my sweet friend Lisa who came to go to the cookie swap with me! 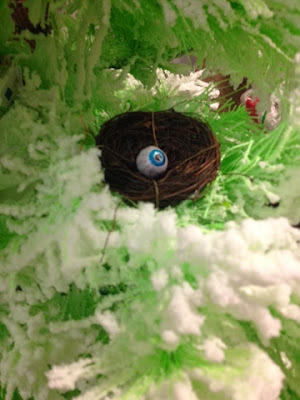 Perhaps the creepiest decoration on a tree….”eye” spied this at Little Acre. 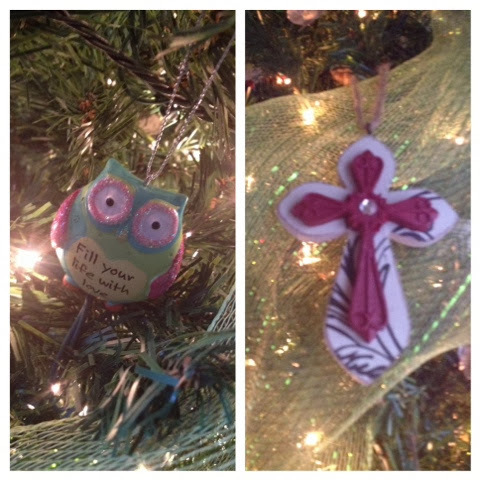 Christmas presents from a sweet friend! 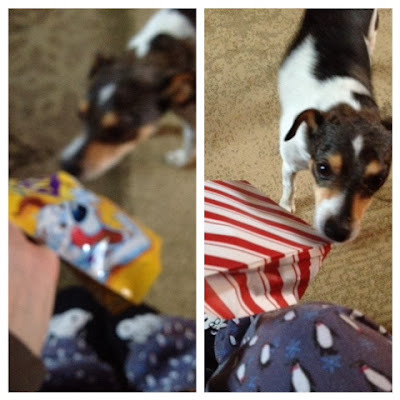 Day 13- a present for Watson…some Begging Strips. Day 14 – The December ornament; Charlie Brown of course…with his tree! 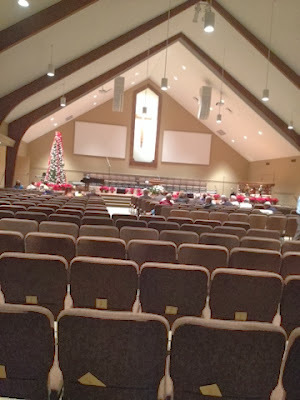 Our church has been building a new sanctuary for the past several months and Sunday was the first Sunday service in the new building – not that I really know too much about how that went – I spent the hour and thirty minute service in the nursery with nineteen children! The sanctuary looks absolutely beautiful though and I managed to snap a few pictures on Sunday night before church started… I’m sure I’m not the only person that was snapping pictures. Two of those poinsettias belong to ME!! 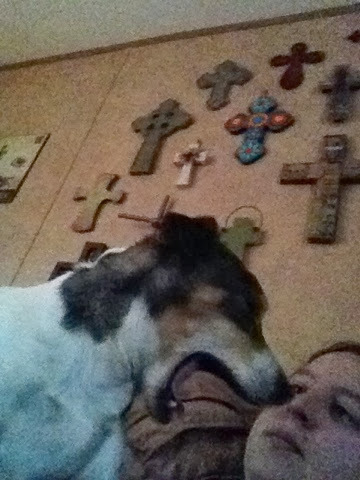 The best part of my Sunday? 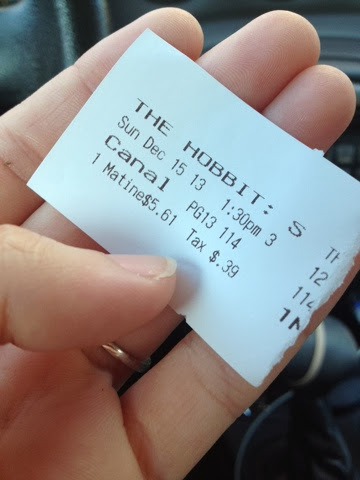 I went to see The Hobbit: The Desolation of Smaug on Sunday afternoon! I went to the movies alone and I didn’t even care because I have been waiting for this movie to come out since I saw the first installment back in late September – I was perfectly content sitting in my seat alone, because I knew an awesome movie was coming up! I enjoyed every minute of it and probably over-elaborated on it to my little sister on the way home. What can I say, I was letting my “I’m a Big Nerd” banner wave proudly! 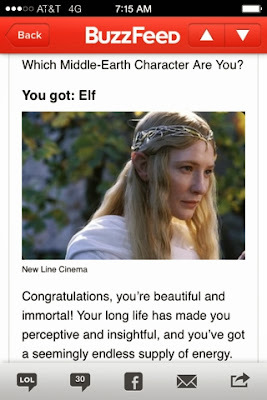 In honor of seeing The Hobbit, I took a quiz on which Middle Earth character I was. I’m an Elf! Dreams do come true, ha-ha! I think I should do this every Monday….don’t you agree? Well folks – that’s all for now I suppose. All my regularly schedule programs have concluded for the year, so I think it’s time for me to go find a nice Christmas movie to watch! Adios for now! Oh my goodness – as I write this, it is Sunday night and I don’t know about you all, but I am tired of this rain! 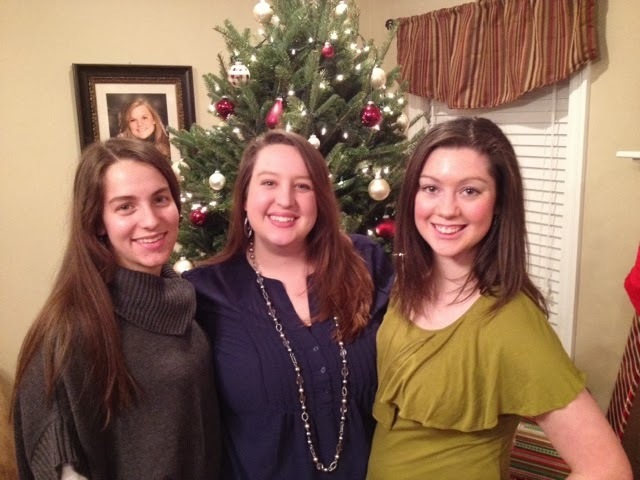 So far this December the weather here in MS has either been way too warm (82!!!) or when it finally gets cooler, it starts to pour rain. I mean – is cold weather – just COLD weather too much to ask? 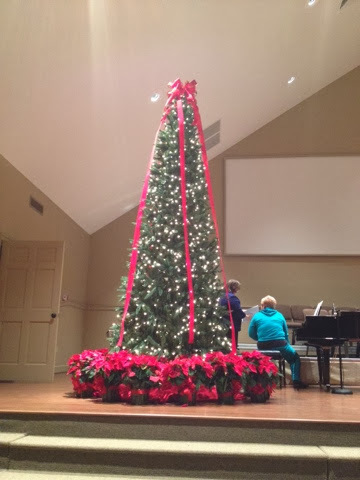 It’s only December 8th, so I guess there is still plenty of time for the weather to be a little more appropriate, right? 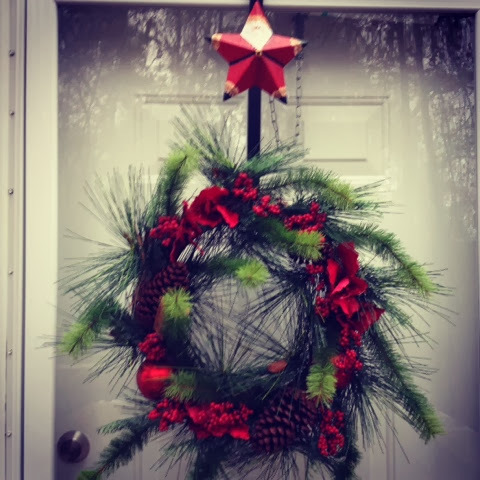 My wreath – hanging on it’s new, absolutely delightful wreath hanger! Monday of this week seems like such a complete blur. I think that day passed in a haze of sleeplessness as I drove/rode with “strangers” and finally was able to take a nap at my own house, much later than I planned to! It was certainly one way of starting off the month of December and it’s not a way I’d want to repeat; ever! Santa is bringing me a shiny new vehicle for Christmas this year and I’ll be more than happy to make the 12-13 hour drive to see my parents before I step on a plane again! 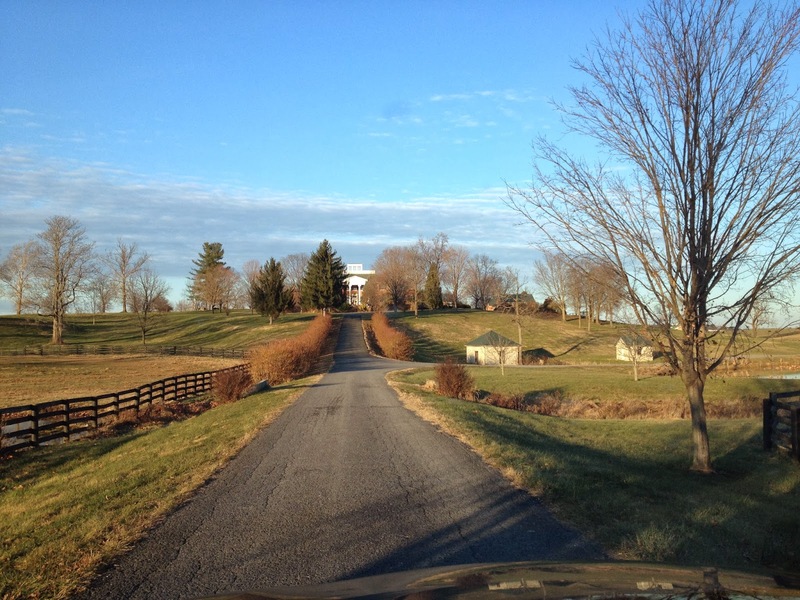 Granted, I’d love for someone to go ahead and buy my house so I wouldn’t have to make the drive at all! Patience is a virtue I’m struggling with in this particular area. So true – I think I feel this way almost every day. The next few pictures – well, you can go ahead and say I’m rotten or spoiled – I don’t really mind. 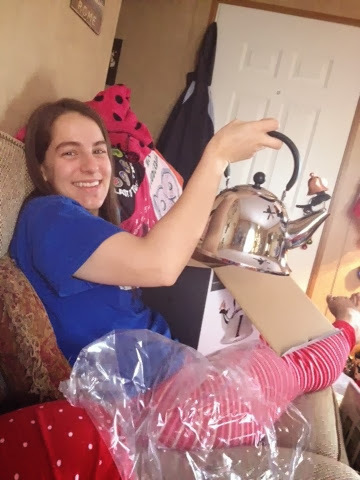 You see, when my sister moved hundreds of miles away to Colorado my parents started a tradition of sending her a box filled with small gifts and she opened one a day until the day she came home for Christmas. 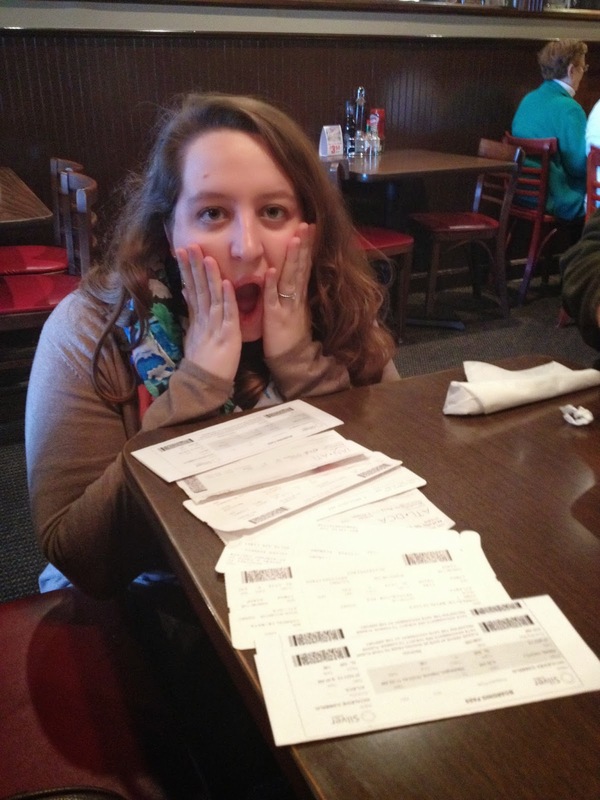 When my parents up and moved hundreds of miles away from me, then I got dealt into the game! 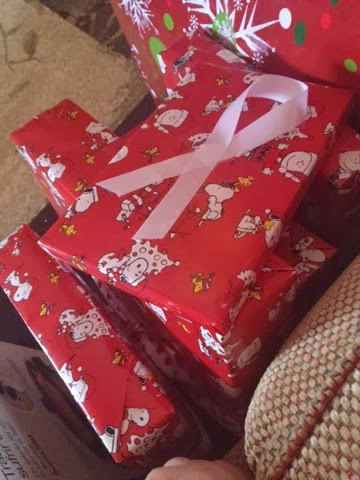 My gifts started on Monday, December 2nd and will go through December 20th because my family will arrive here in MS for Christmas on the 21st! 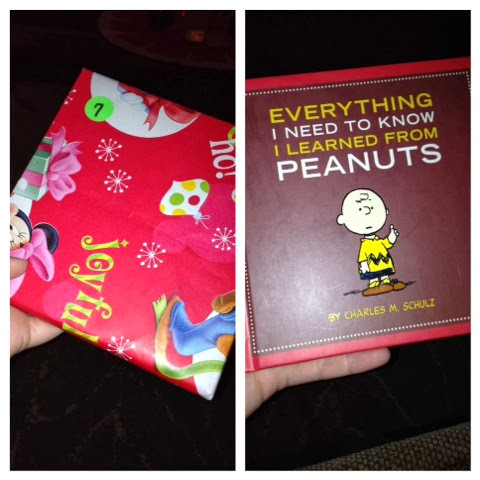 So, I’ve been opening a small gift a day; I save mine until after work so that I always have something to look forward to! 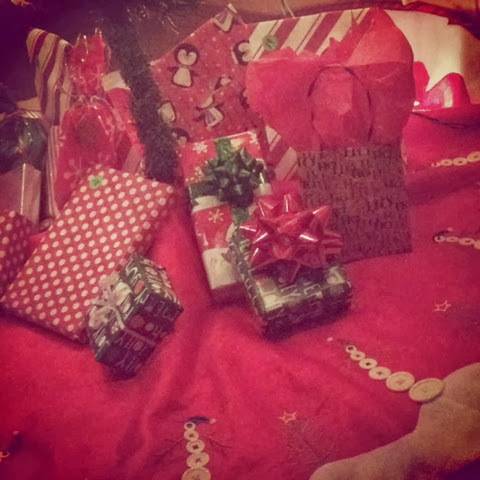 And some of the gifts aren’t even for me – some of them are for Watson! Day 2 – the start of a yearly collection of ornaments. September is Sally! 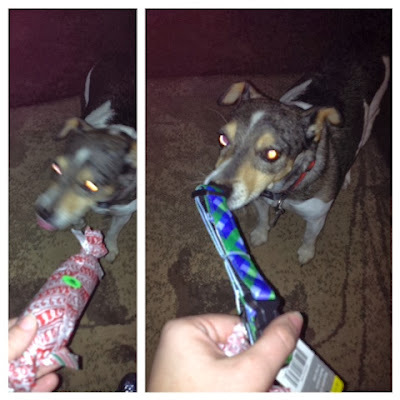 Day 3 – for Watson, a bag of Busy Bones! 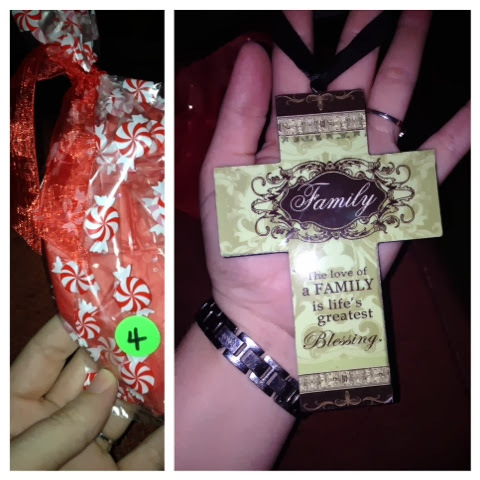 Day 4 – a cross hanging with a quote about family! 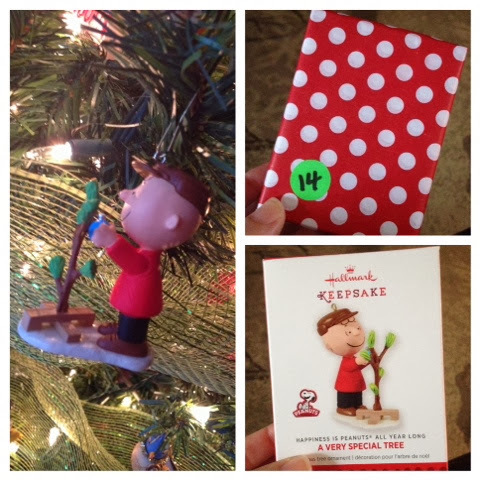 Day 5 – The second in ornament collection; Linus is October! 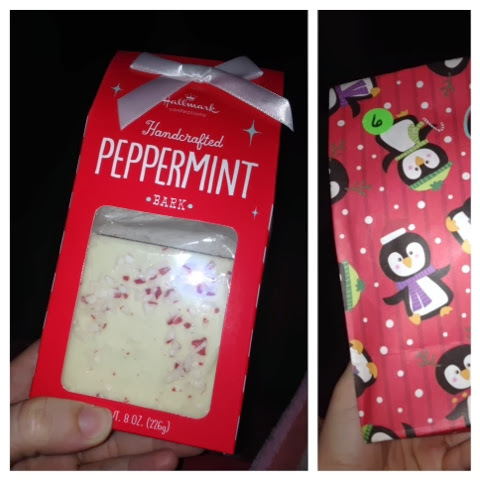 Day 6 – Peppermint Bark! So delicious! The week somehow seemed to pass so slowly this week! Which is ironic since this time of year, my workdays go by so fast that I feel like I can’t catch my breathe once I arrive at work. I think with the week starting off as crazy as it did, the whole week somehow seemed off kilter! I just know I was so happy to see Friday at 5 o’clock come because I just wanted to go home and do nothing – which is what I did on Friday night! I caught up on all my TV shows that I’d recorded on Thursday night; I was too busy on Thursday night watching The Sound of Music – Live! to watch my normal shows. It was excellent, by the way. I’ve read so many negative comments about it online but I enjoyed every minute of it and thought it was really incredible for a live performance! I spent my Saturday morning alternating between being lazy on the couch watching Christmas things, being lazy on the couch reading or being useful and doing some housework. I went out to eat Saturday night with a friend and since it was absolutely chilly outside, I got to wear my awesome new boots and was pretty darn excited about that! Sometimes it’s the little things people – the little things. 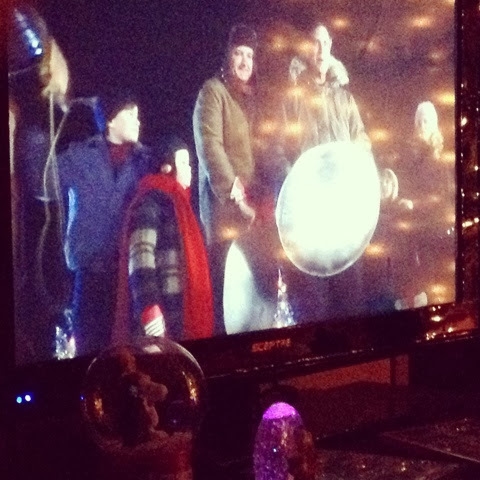 A Saturday afternoon movie – National Lampoon’s Christmas Vacation; I’m pretty sure this is Lindsey’s favorite scene! 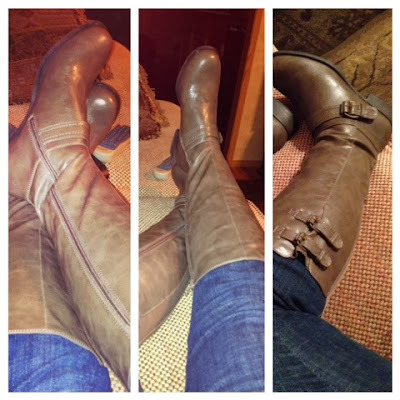 My boots are awesome – aren’t they? Yes – the answer is yes. My new sweater and my blinging “Emerald” necklace are also awesome. This morning, one of my friends from high school brought her new baby girl to church for the first time and so, I was in absolute heaven! 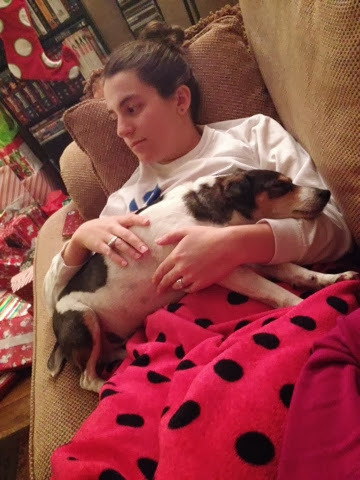 I loved and cuddled that sweet tiny baby for over an hour. Sometimes my job as the church nursery coordinator stresses me out – but I find it’s normally the adult aspect of the job that stresses me out, never the kids! The kids are what makes the job so wonderful and my Sundays are always made all the better by the funny things they say, the sweet things they do (and sometimes even the funny but not so sweet things they do/say) and their precious smiles. There is something so heart-warming about holding a sweet new baby or having a normally wild toddler climb into your lap and snuggle and I wouldn’t trade those moments for anything; I love the time I get to spend with “my” babies. 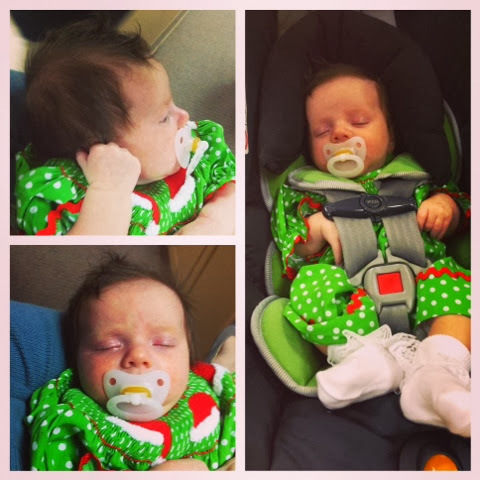 Precious girl – only our first meeting and I’m already in love! Such a sweetheart! 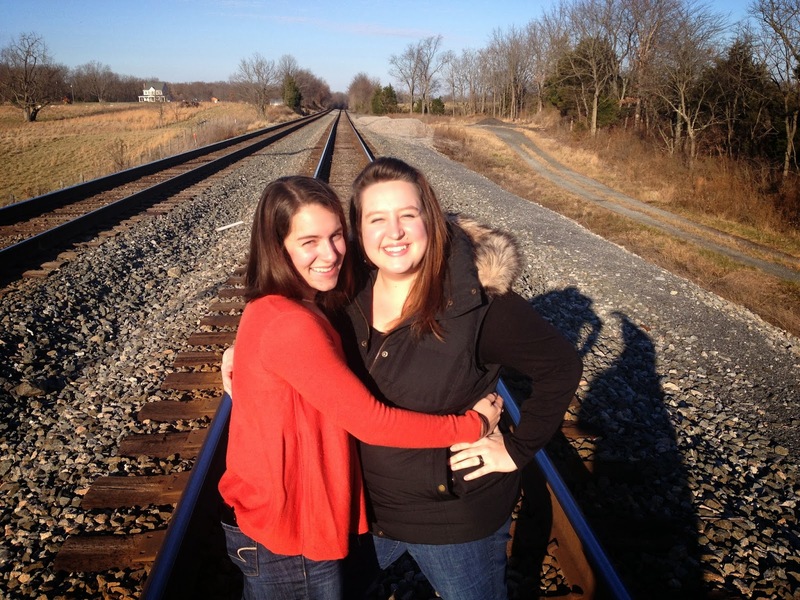 The girls – so sweet and precious each in their own way and both so absolutely adorable! My new owl tote from Thirty-One…and it was only $8! 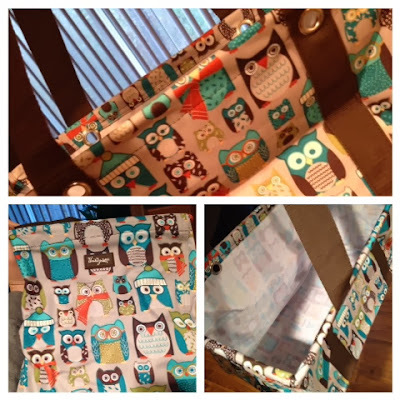 I love it and I’m already putting it to good use! Also – as mentioned, it poured all day today. 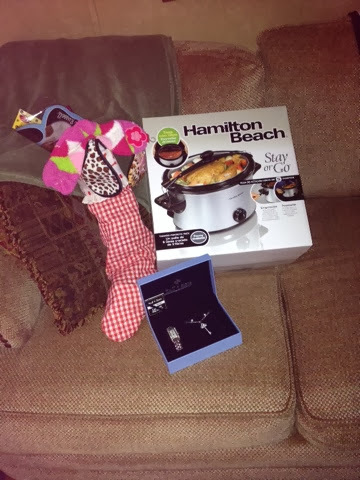 So soup, a warm blanket, toasty socks and a good nap on the couch were about all the business I had time for this afternoon! Watson took a nap too, since he is thoroughly spoiled and trained to behave very much like his Momma on Sunday afternoons! I did manage to wrap a couple Christmas presents though! 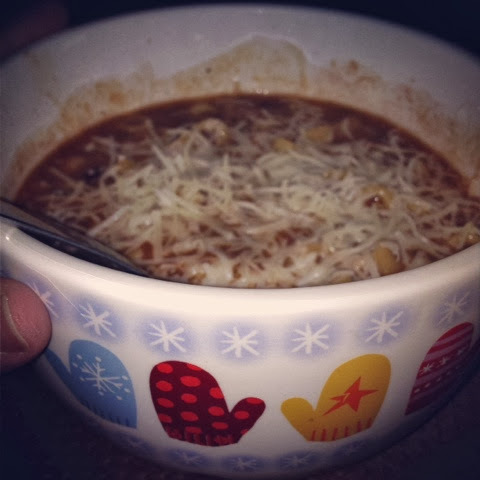 A big bowl of soup is really the only remedy for a wet, chilly day! 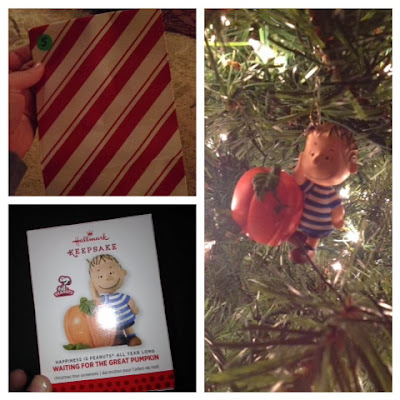 Day 7 – this awesome book! *sigh* I love my Christmas tree! That’s all for now folks – I think I’m about to pile up in the middle of my toasty warm bed, read a good book and get some sleep. Because what else could be better on a rainy night than a good toasty bed and catching some Zzzz’s? I’m sure you are looking at that title and thinking that I’ve veered into the land of craziness. I promise I haven’t – this is actually a recipe post. 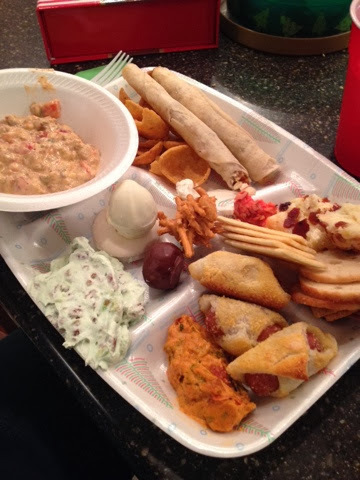 I can’t take credit for the name of the dish; that credit goes to my Great Aunt Joyce. My Aunt Joyce was my Dad’s Aunt; his Dad’s sister and she lived in California, which was wonderful for my parents when they were newly married and my Dad was stationed at Vandenburg AFB, in California! She shared some of her recipes with my Momma and so I’m sharing one of my favorites here with you. 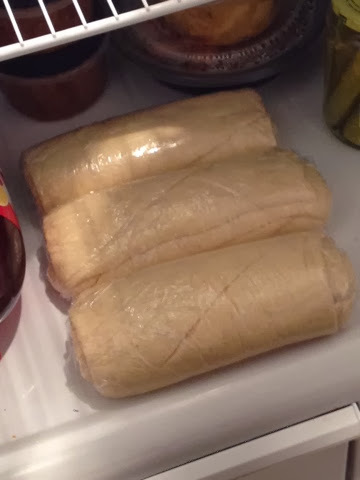 Fun fact: Until about three years ago, I would NOT eat this. I don’t know what is wrong with me but obviously something was. Thank goodness tastes change as we get older, because this is delicious. 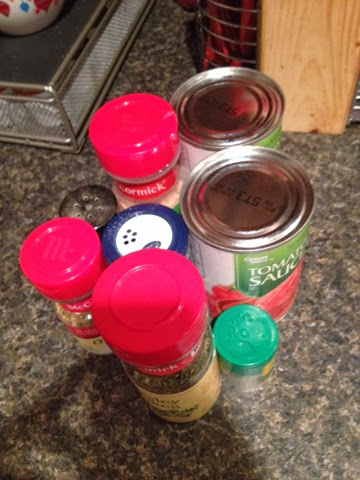 Spices and tomato sauce – always important. 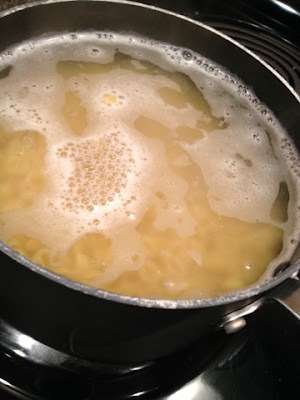 Cook your noodles, drain and set aside. 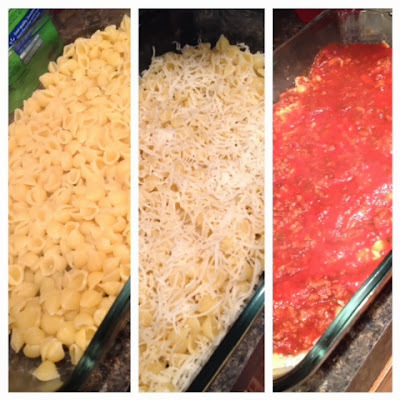 You will layer in the pan; starting first with noodles. 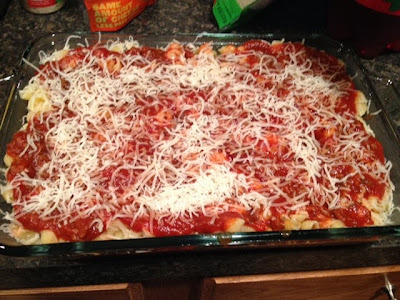 Top with a mixture of shredded mozzarella, shredded Swiss and Parmesan cheese. Top with sauce mixture. 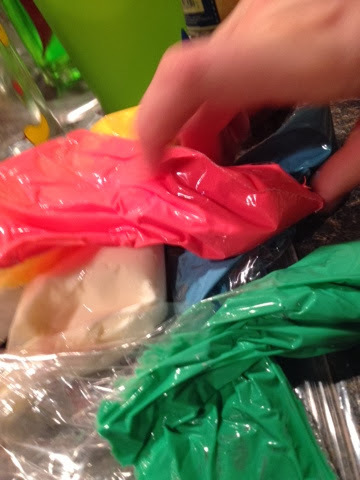 I had enough for two layers; depending on how much you choose to make/how deep your dish is, you may be able to make more. Top the last sauce layer with the shredded cheeses. 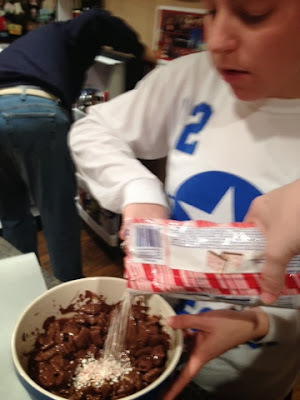 Bake at 350 for 25 minutes – allow to cool for about 2-3 minutes and then dig in! This is great with some garlic bread on the side! 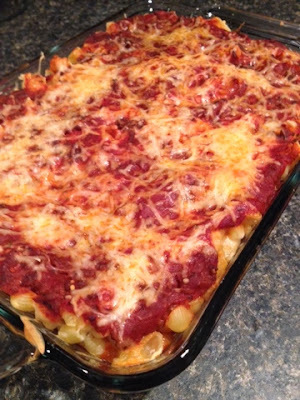 Delicious and warm, straight from the oven and into your belly! So there you have it – a meal I love to make. 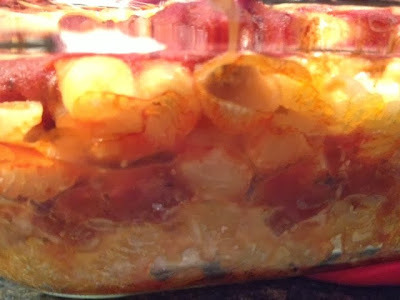 It is easy but tastes like something you spent a long time on! 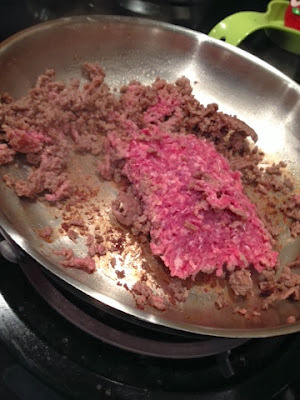 I guarantee this will be a hit, no matter who you serve it to! 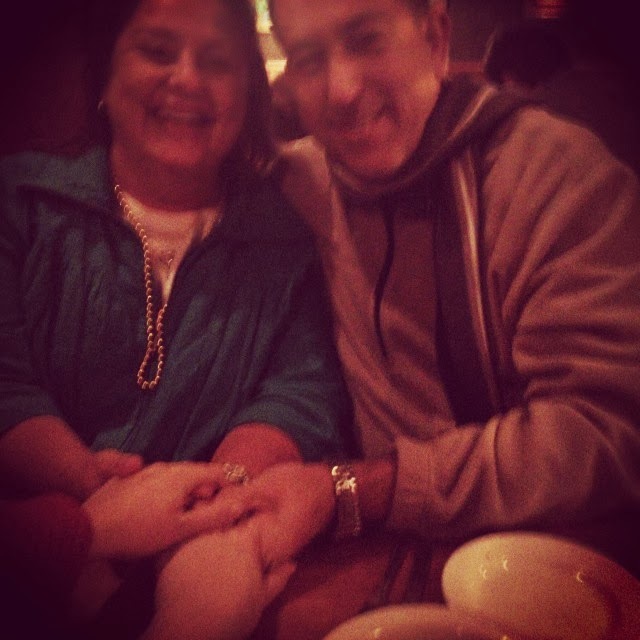 Supper at Okra’s Cajun Cuisine in Manassass; absolutely delicious and I was with my family! 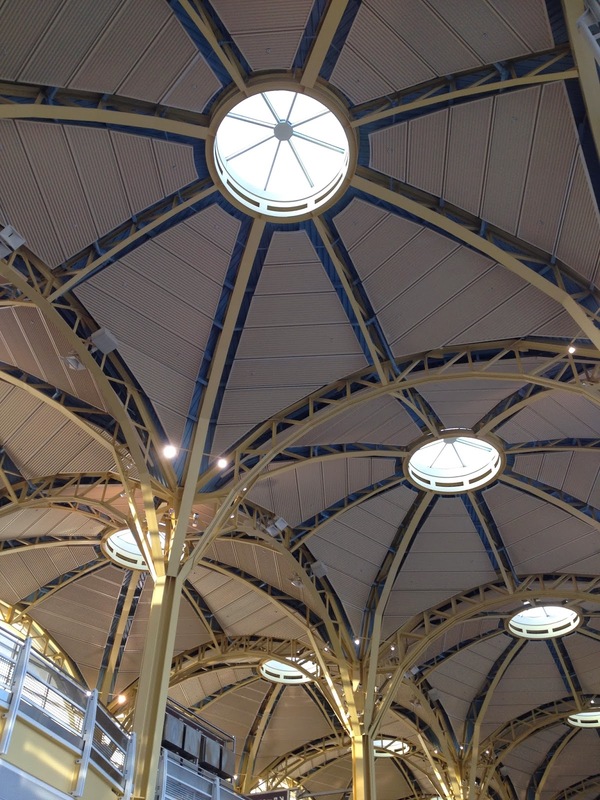 I never get tired of this view – never. 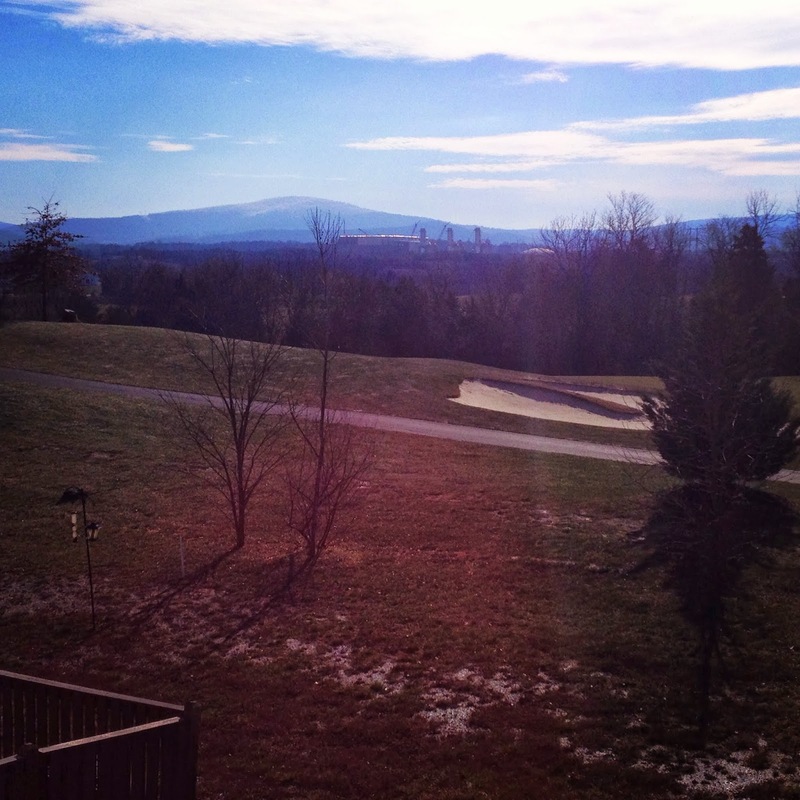 It is gorgeous every single time I’m in Virginia. 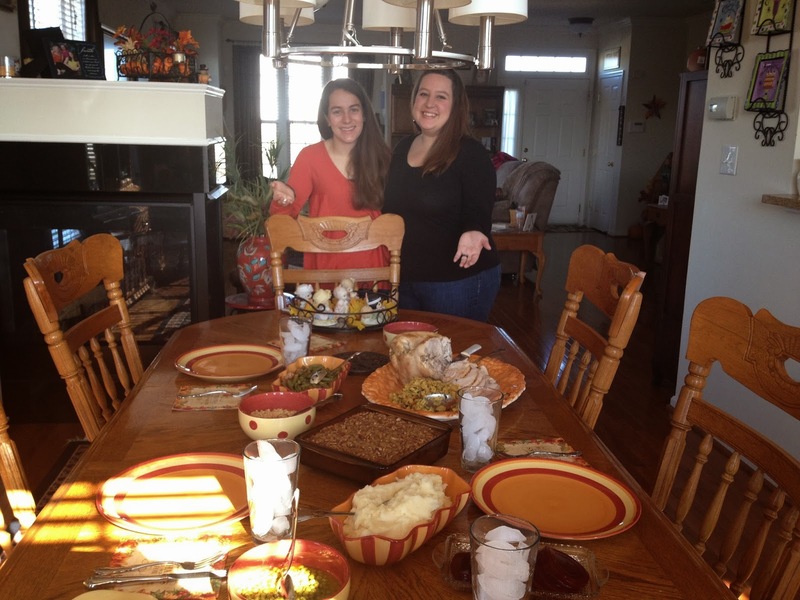 The Thanksgiving feast! Delicious as always! 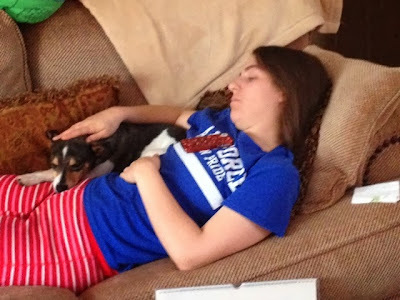 Ha-ha; just being silly – we didn’t need naps but we had to imitate Dad since he was sacked out and in another world. My Dad decided on Thanksgiving afternoon; after we’d all stuffed ourselves with food, would be the perfect time to go take pictures for the potential family Christmas card. 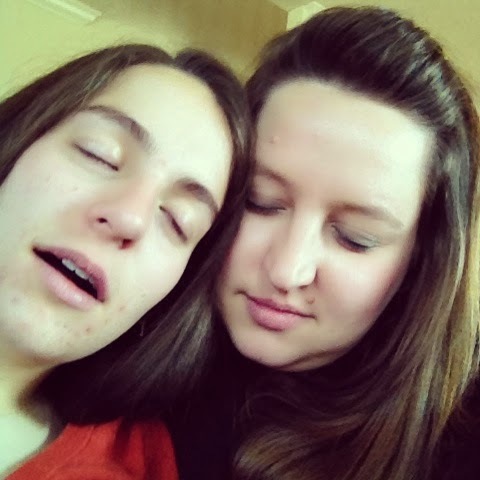 It was all well and good, except that since Lindsey and I don’t live together anymore when we are together we tend to get a little bit silly. 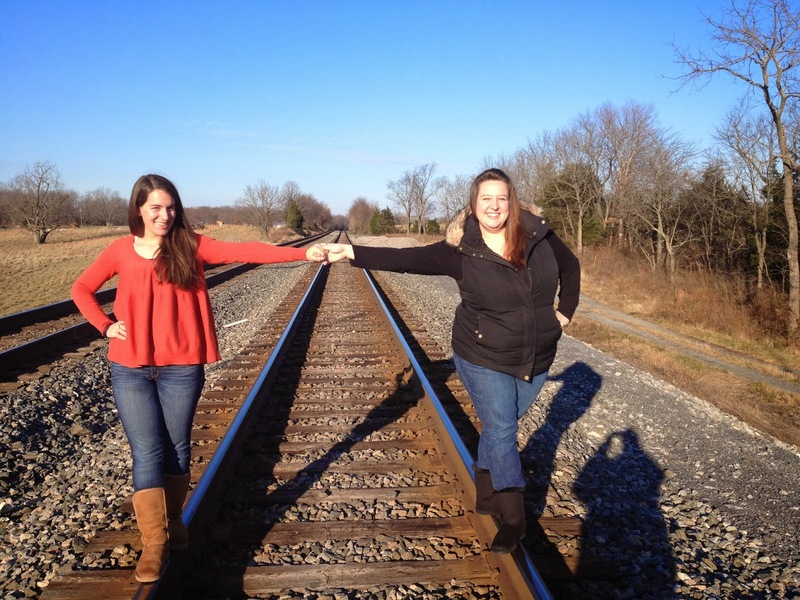 While my Dad was trying to adjust the camera, organize certain shots and get the right light…Lindsey and I were jumping around the train tracks, dancing around at the edge of the field, trying to climb the fence and talk to the horses…basically acting our ages (29 and 23)..right? I think we may have frustrated him just a little bit – but somehow that only managed to crack us up that much more. Blessedly we got the pictures made without anyone losing any limbs (even if we did make my Dad lose his mind a little bit) and then we rushed off to the movies to see Catching Fire – which was AWESOME. I think we even got my Dad hooked, since he asked as we left the theater when the next movie in the series comes out. When we weren’t busy acting wild…. See Dad – we can act right; even if it is only for the approximately 8 seconds it took to pose and capture this shot. YES! 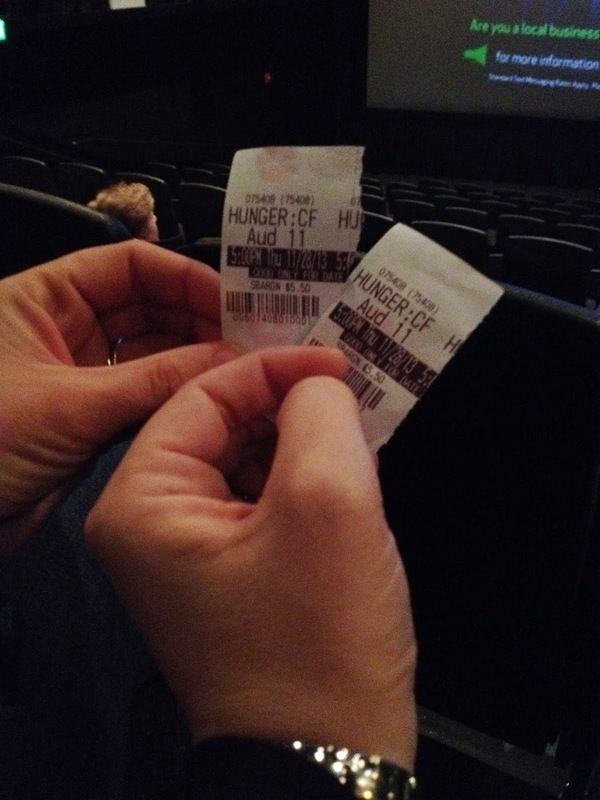 Finally seeing Catching Fire – so excited! We did minimal Black Friday shopping once the movie was over. 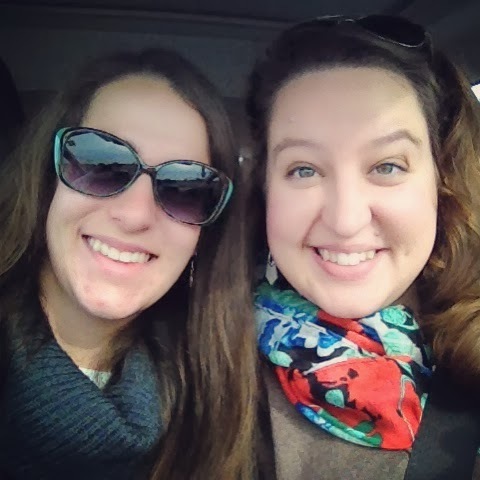 We considered going to Belk, but after we saw the line wrapping around almost three sides of the building, we passed. The line at H.H. Gregg wasn’t that long and so we decided we’d see what they had to offer. 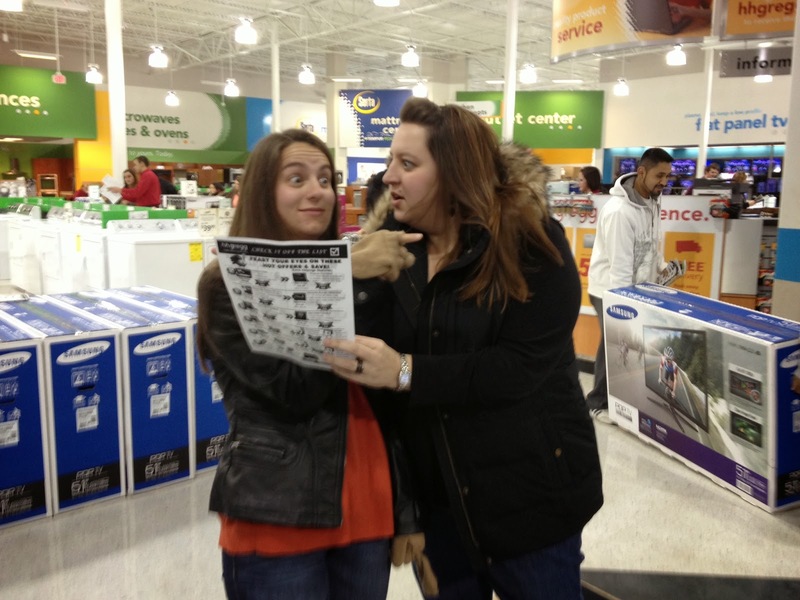 At least, my Dad decided to – Lindsey and I were too busy taking crazy pictures, testing the couches and discussing Catching Fire while people scrambled around to see what they could find. 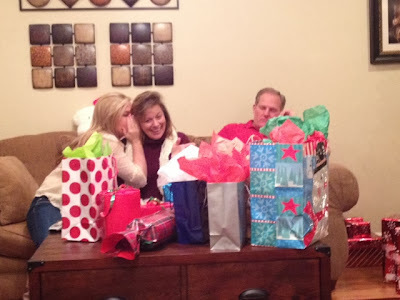 Black Friday madness just isn’t really my game – or apparently my families’ thing either; I just don’t see why people feel the need to practically kill one another (it happens every year – someone gets killed in pursuit of a 60″ TV – so sad) over “things”. I know doing Black Friday shopping is a tradition for some folks, but I’ll pass. Give me my bed; I like to be asleep at 5 AM, not fighting people for some boots! Where to go first? 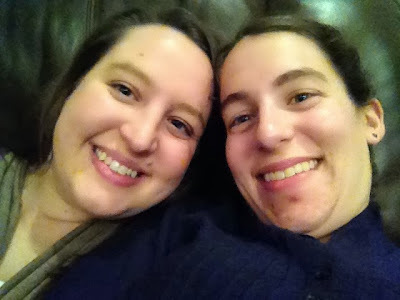 Kidding…we found the couch and watched. Smile! 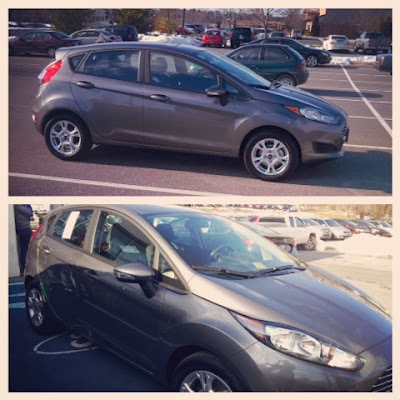 I am test driving what will soon be my new car! Oh happy day! Friday was a fairly relaxed day; we slept late and had some pretty delicious breakfast while we decorated my parent’s house for Christmas. 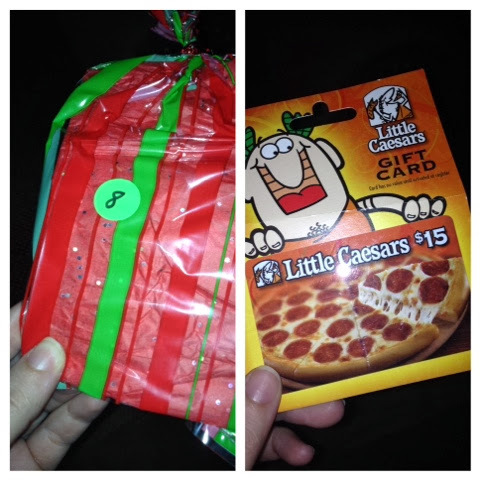 My Dad went to work around 1 and the three of us ladies headed out to see the movie Frozen and do some shopping. Frozen was another absolutely awesome movie; Disney scores again with amazing story-telling and really catchy songs, but the best part was that the movie was about the love between sisters – and that touched my heart! 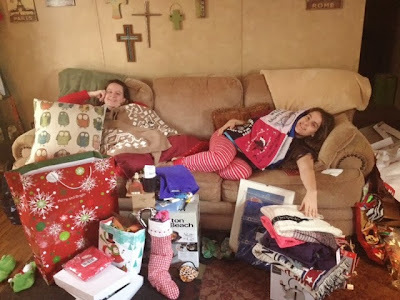 We shopped until we (almost) dropped once the movie was over and even though we hit the Black Friday deals pretty late in the day on Friday, we still managed to get quite a few deals! The Party Wagon – I can’t wait for Christmas y’all! 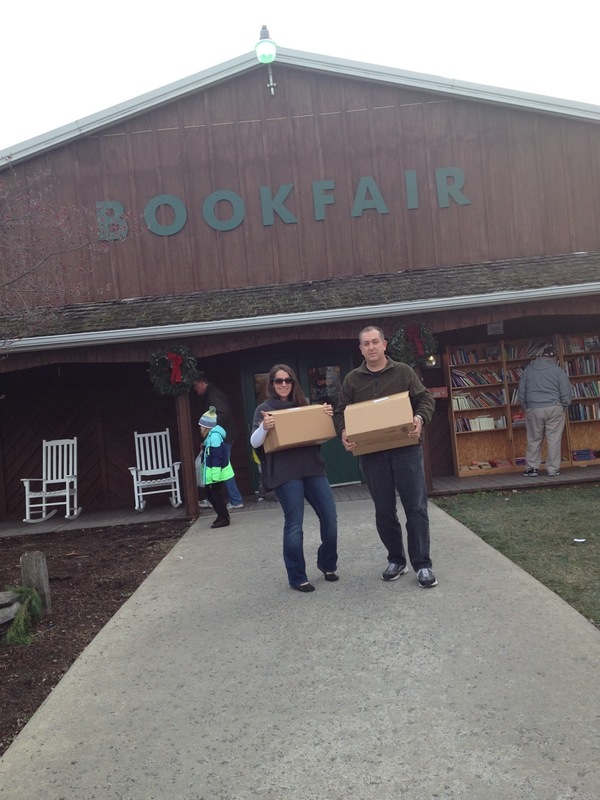 Leaving the Book Fair with all our goodies! 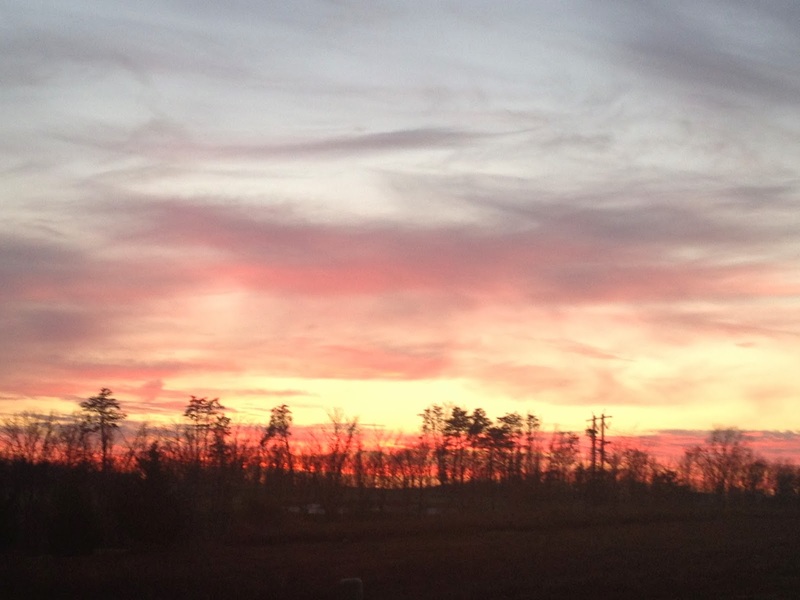 A gorgeous sunset on Saturday night! Saturday night we went to check out some Christmas light in a park in nearby Winchester. 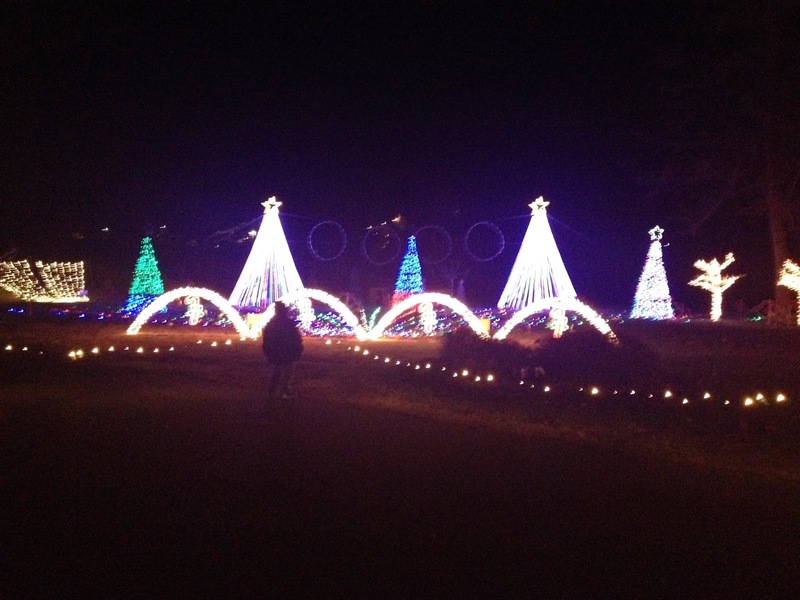 There was a mile long walking path through the park and there were lights on every inch of everything in that park! 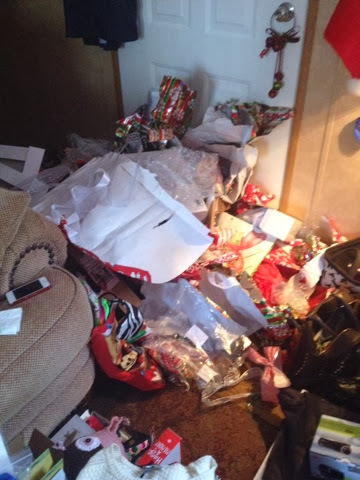 It was basically a Christmas wonderland. 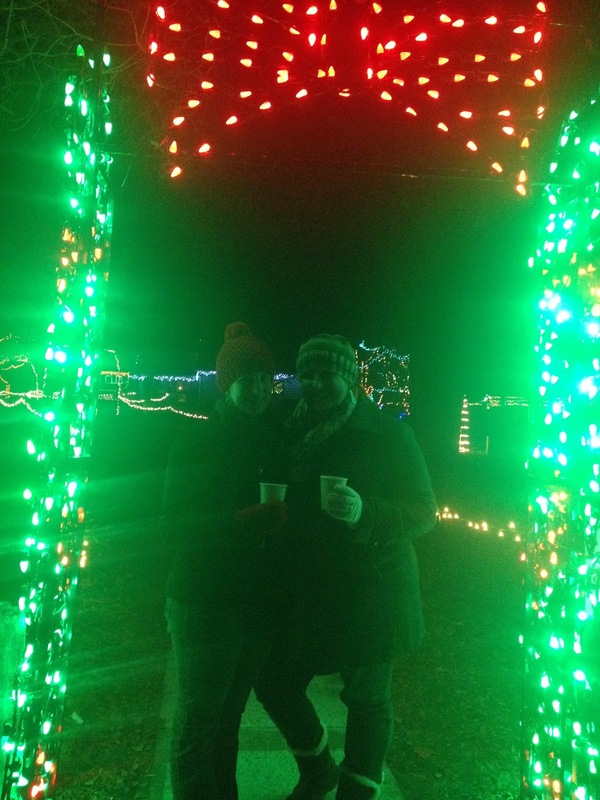 The weather was perfect too – it was a brisk 28 degrees outside, so we were all bundled up as we strolled through the lights – they even had hot chocolate for you to drink as you strolled. Also fascinating to me? There was a lake in the park and it was frozen! Of course it wasn’t frozen solid but it was pretty well icy and for some reason that absolutely fascinated me – maybe because in my 29 years I’ve never really seen that? Who knows…but I thought it was cool! Taking in the Christmas lights with some hot chocolate! 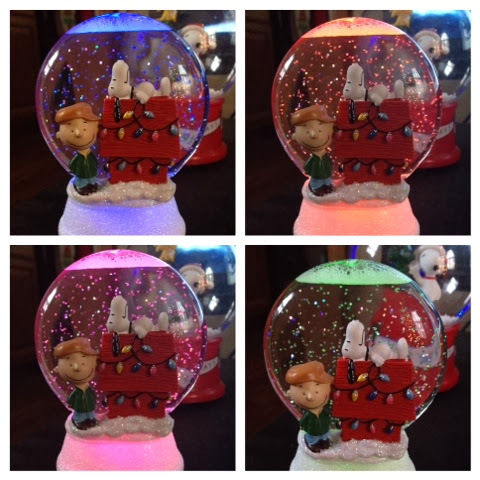 All of these lights were set to music…so cool! 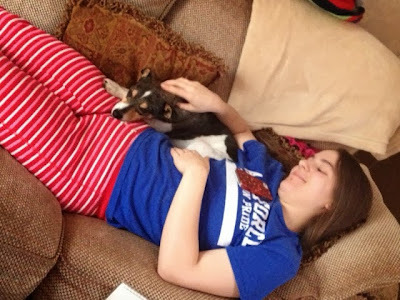 So there you have it – just a little glimpse into my Thanksgiving break! Now I’m counting down the days until Christmas break, because whenever my family is together, it is guaranteed to be an absolutely wonderful time!